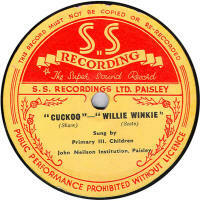 British 78rpm record labels whose name begins with S. Using the letter links below you can see pages for other letters. S & M These were issued by Swarbrick & Mossman of Glasgow. 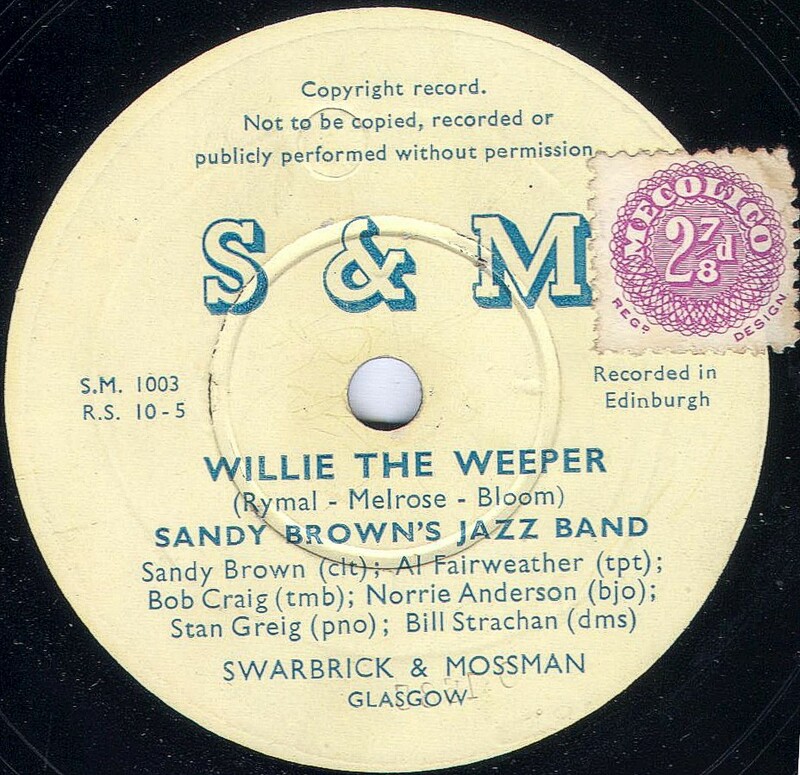 Most issues seem to be of Sandy Brown's Jazz Band, of Edinburgh and some by Archie Semple. 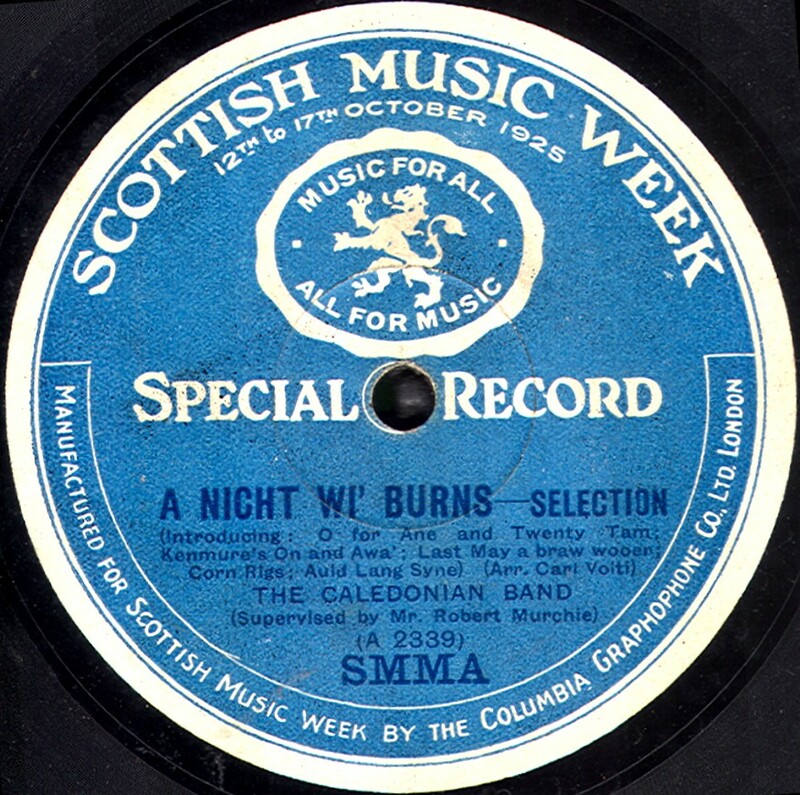 The records were available from 1949 to 1952 and were limited edition pressings (probably less that 100 of each to avoid purchase tax). 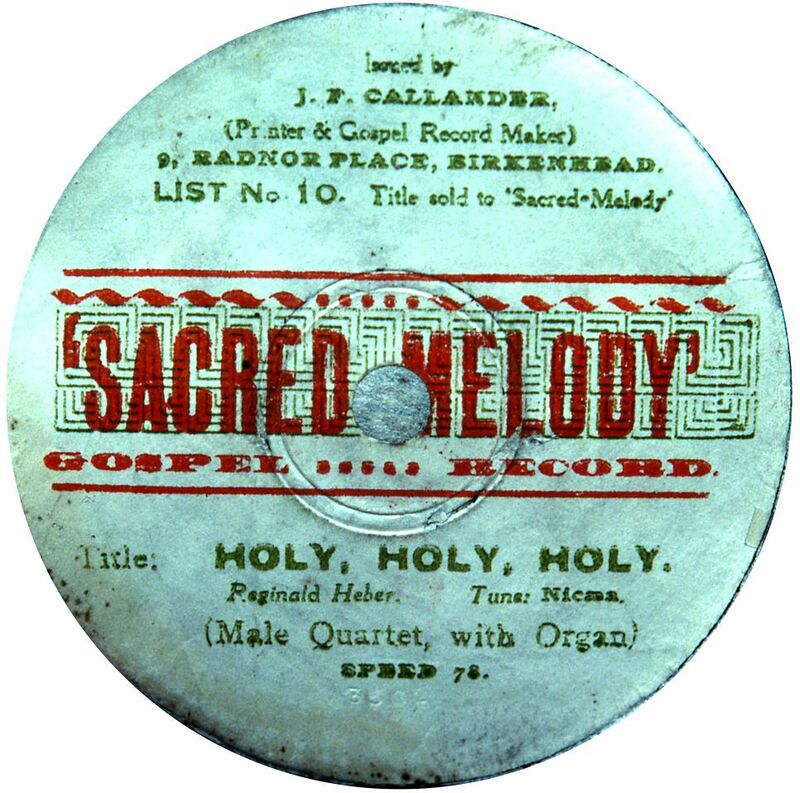 Sacred Melody These single-sided records and the labels were reportedly made by J. F. callander in a workshop in his gaeden, where he had a hand-operated record press. He used masters formerly belonging to British Homophone and Piccadilly records and the record material purchased from someone who had previouslty supplied the Douphone Unbreakable Record Co. 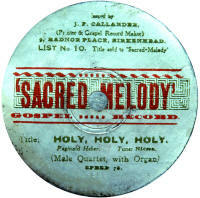 The records, which were solely of hymns, were sold cheaply or given to charities. The pressings date from around 1935, when Calllander's activities were reported in "The Talking Machine & Wireless Trade News" (June 1935). 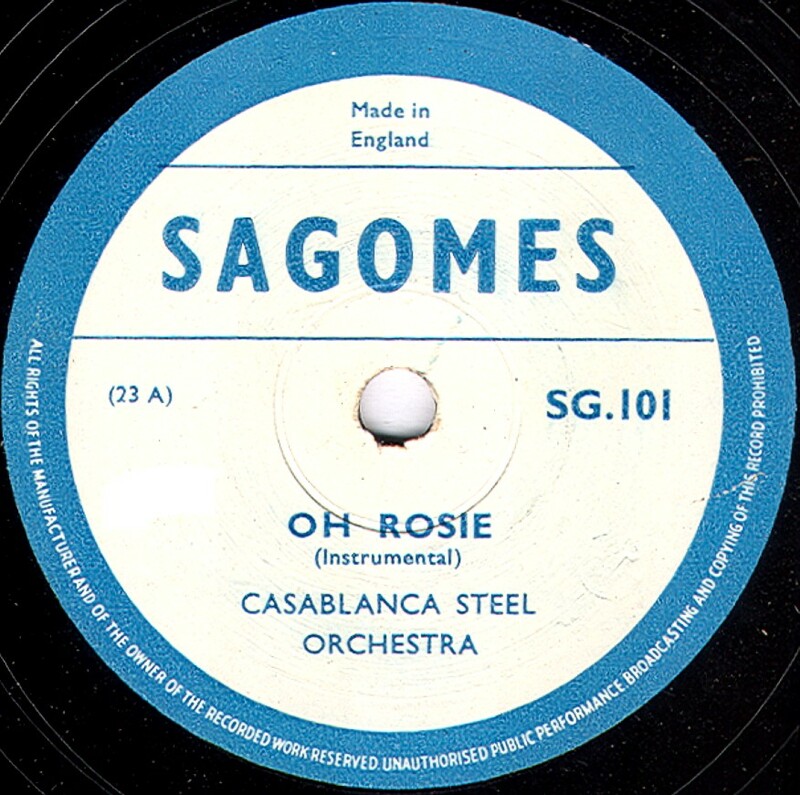 Sagomes The proprietor was Eduardo sa Gomes, a music and photographic dealer in Trinidad. 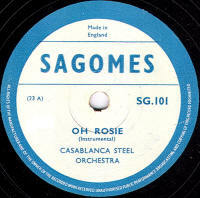 He organised the recordings, usually in New York by American Decca, and the records were pressed by Decca in the UK and sold in the Caribbean. 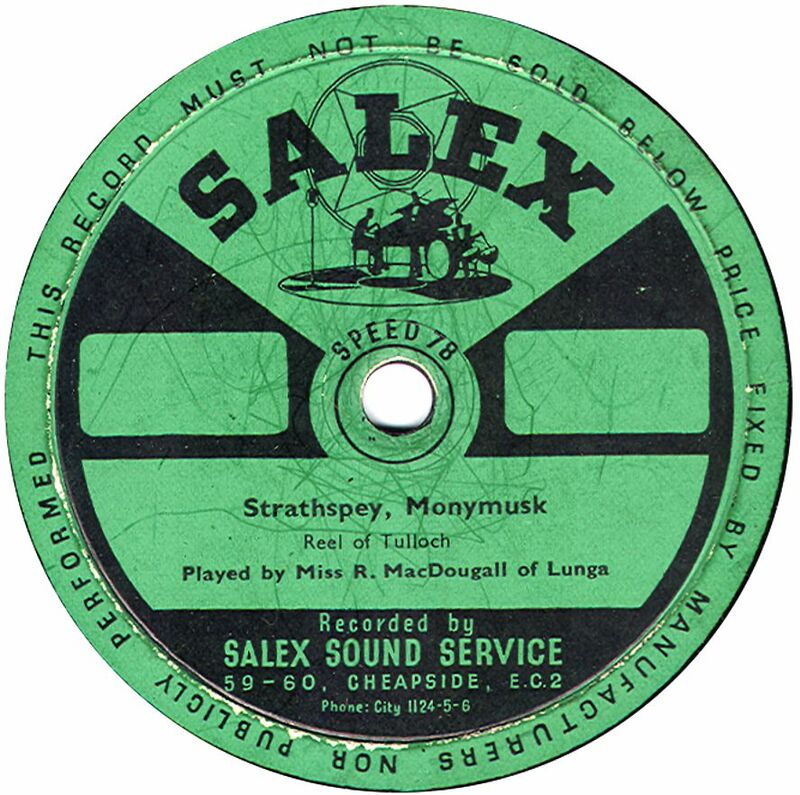 Salex A private recording operation owned by Sales Sound Service of Cheapside, London, believed to date from the late 1930s onwards. 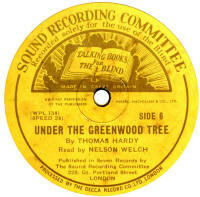 The records may have been pressed by Decca. Saturn These attractive picture discs were produced on behalf of ASICo (The Arts and Sciences Improvements Company). They were made out of something akin to the standard shellac, but with an image included within the upper surface. 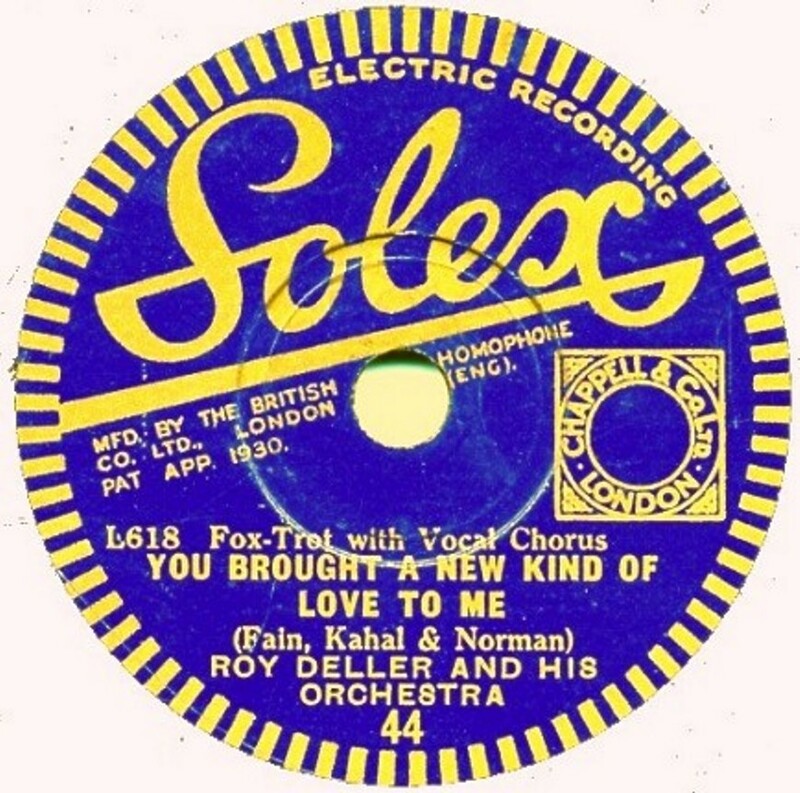 It is not known what the source of the recordings was, but the example I have here was made in England by Decca, though I have not seen anything that explains how these were manufactured. Dating them is tricky as well, but I would guess they are from the 1940s or 50s, but oddly, the run-off locked groove on mine is concentric in the manner of records from pre-1935. This implies to me that the recording is foreign, probably from a small specialist recording company. I would be grateful for any further information, or examples, preferably with images. 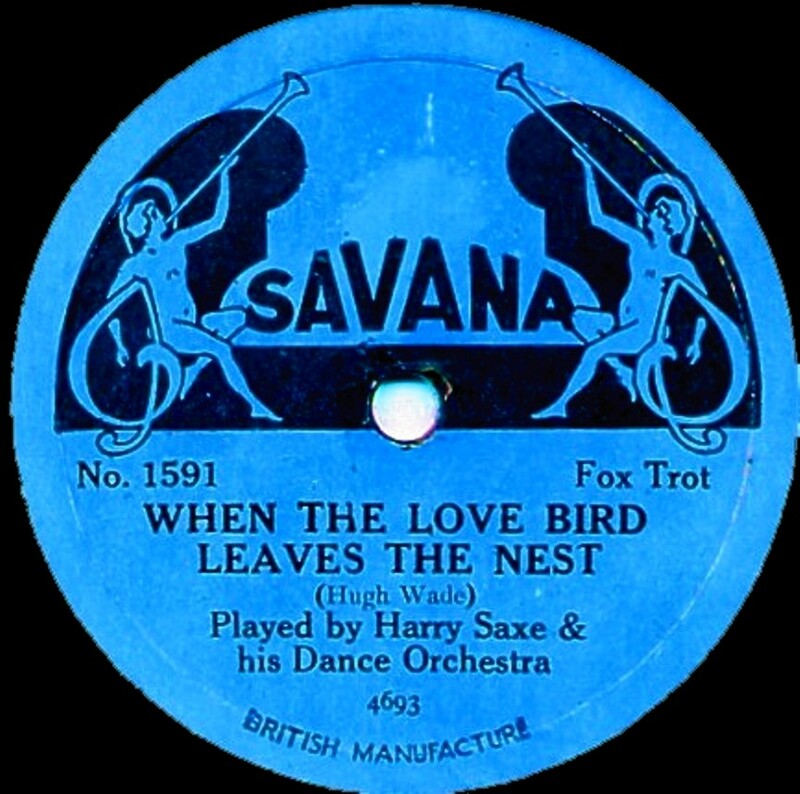 Savana Savana records were made for Rose, Morris and Company and appear to date, musically, from 1925-27. They were available in 5½", 6" & 10" sizes. The 10" use Crystalate (Imperial) masters and cost 2/- each. The others use (Edison) Bell masters or (again) Crystalate ones. The label designs were identical for all sizes. The 10" used a 1500 series catalogue, the smaller ones use a 3-digit number. 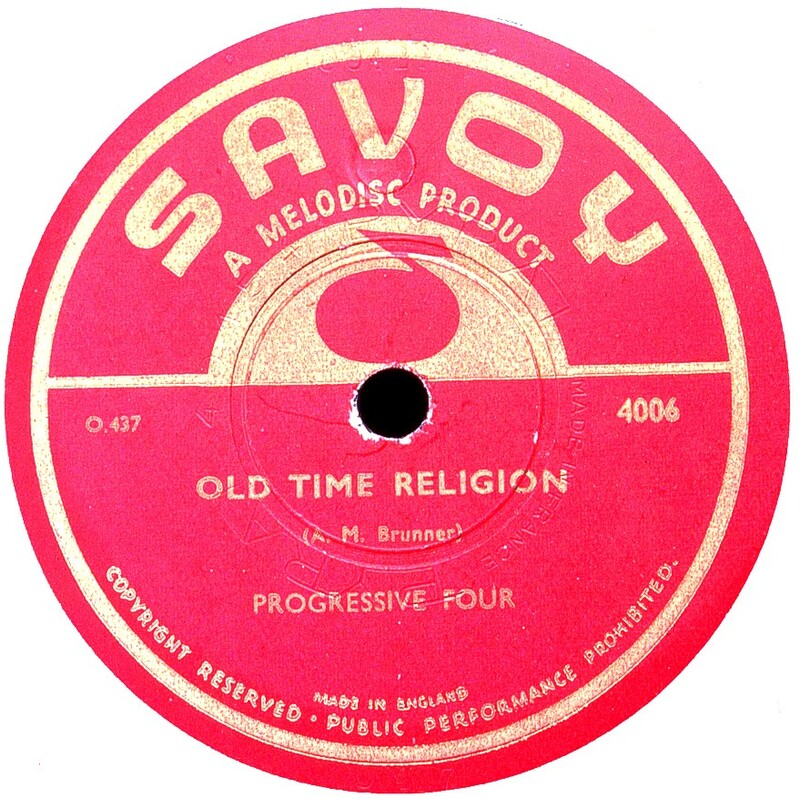 Savoy A Savoy record was announced in the late 1920s which appears to be a flexible picture record, maybe similar to a Goodson, with printing upon the surface, or a Trusound, with the picture encapsulated within the material. Photographs purporting to be of demonstrations of the flexibility of the records have been seen, but no records have ever been reported, and it is likely they never reached the market. 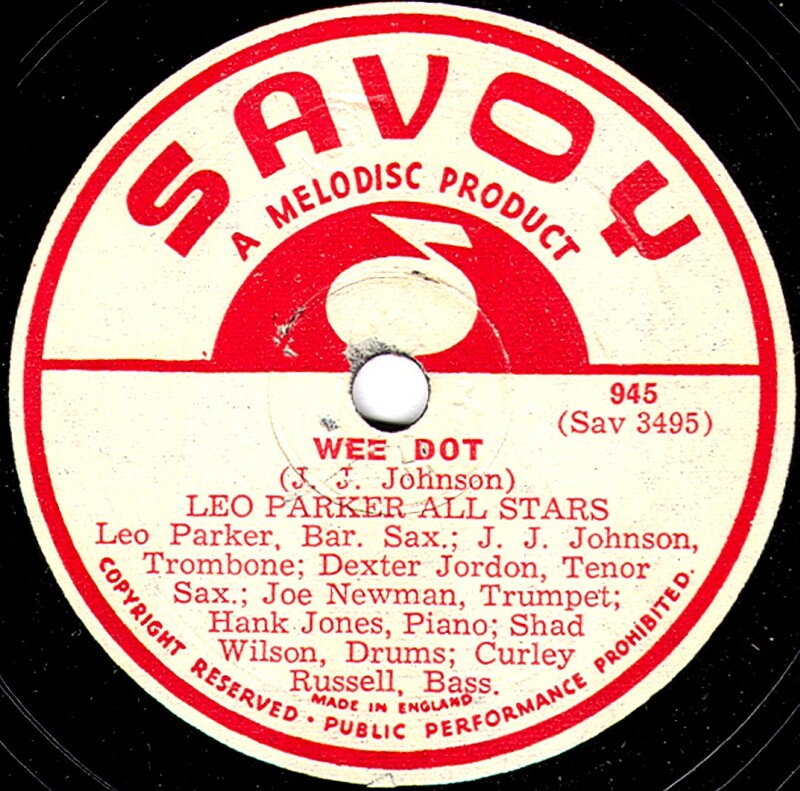 In September 1949, a new Savoy record appeared, issuing modern American Jazz recordings. 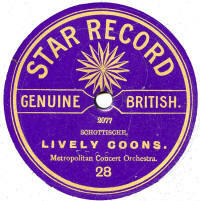 The records were pressed by Levy's at Aston Clinton, Bucks, and distributed by Melodisc and cost 5/9. 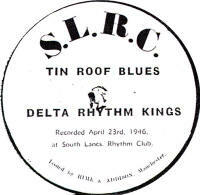 Thanks to Bill Dean-Myatt for providing the label images of the later Savoy records..
Scala Scala records first appeared in Britain in 1912, part of the cheap German import invasion which helped drive prices down at the time. They used mainly Beka/Lindström masters at the time, and a catalogue series starting at 1. The exclusive distributer was Wm. Cooper Bros, of Manchester & London. Initially they were made in Germany, but production increasingly moved to England following the opening of Lindström's factory in Hertford in 1913, and the outbreak of WWI in 1914. By the end of the war, Scala had reached just over 1100. The after a short break, production passed to Crystalate, who restarted the numbering at 1200, aligning it with Coliseum, and for the next 156 issues the two labels issued the same material on the same catalogue numbers (though using different pseudonyms). Scala continued then from 360 (i.e. 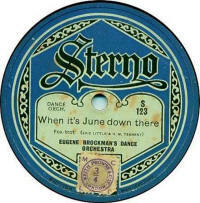 dropping the leading '1',) with the label design as shown, right and by now made by Vocalion. 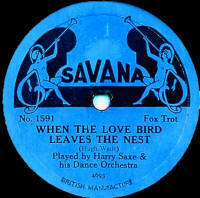 The series reached 822 by 1927, when Vocalion ceased contract 10" pressings, to concentrate on their 8" Broadcast records. 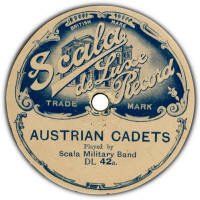 Scala De Luxe Dating to 1913 - 1915, these were originally the 12" equivalent to the standard Scala record. The first issues used a catalogue series DL-1 to DL-400. Subsequently these were all re-issued in a numerical series starting, rather oddly, at 1497, running to 1579. The series continued from 1580 using new recordings, running up to about 1664. Then starting a new series from 5000 to 5039. 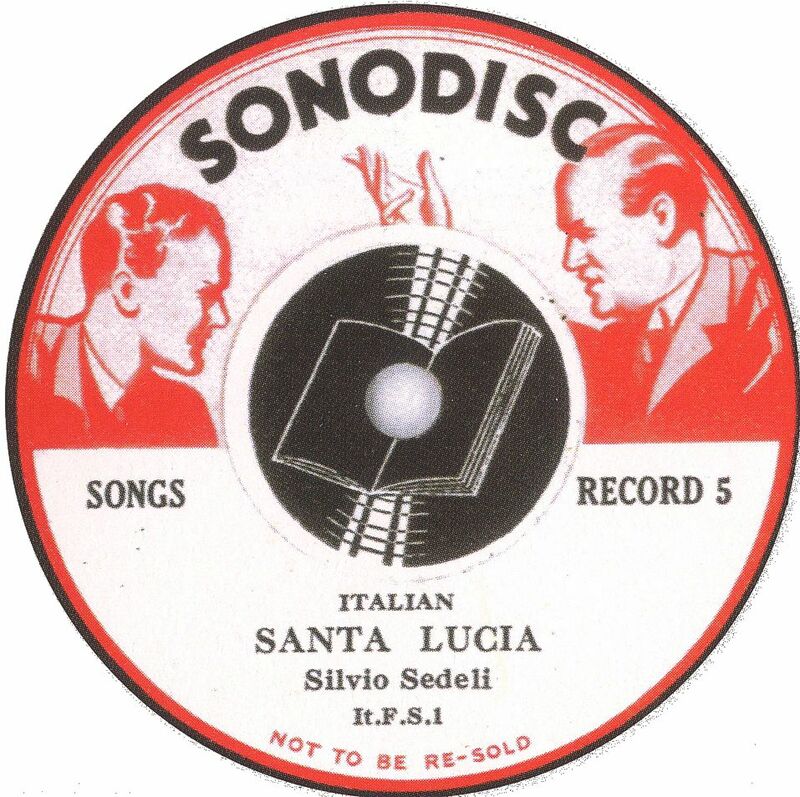 It is believed that all Scala De Luxe records were made in Britain at The Mead Works, in Hertford. My thanks to Norman Field for the label scan. Scala Grand Opera Record A rare series of three 10" records issued in the spring/summer of 1914, these were numbered 3001, 3002 and 3003 and cost 3/- each. Details of the reccords and the label design are not currently known to me. Any information, including a label scan would be gratefully received. Scala Ideal This label was produced between 1923 and 1927 and the master pool is similar to the Grafton label (q.v.). Early issues use Federal and Emerson masters from America. Then subsequently, Pathe provided the source material. The catalogue numbers were usually in a 7000-series and there were just over 200 different records produced in the 4-year period. The records cost 1s 6d. SCF Film Studios Thanks to Bill Dean-Myatt for providing the label image. 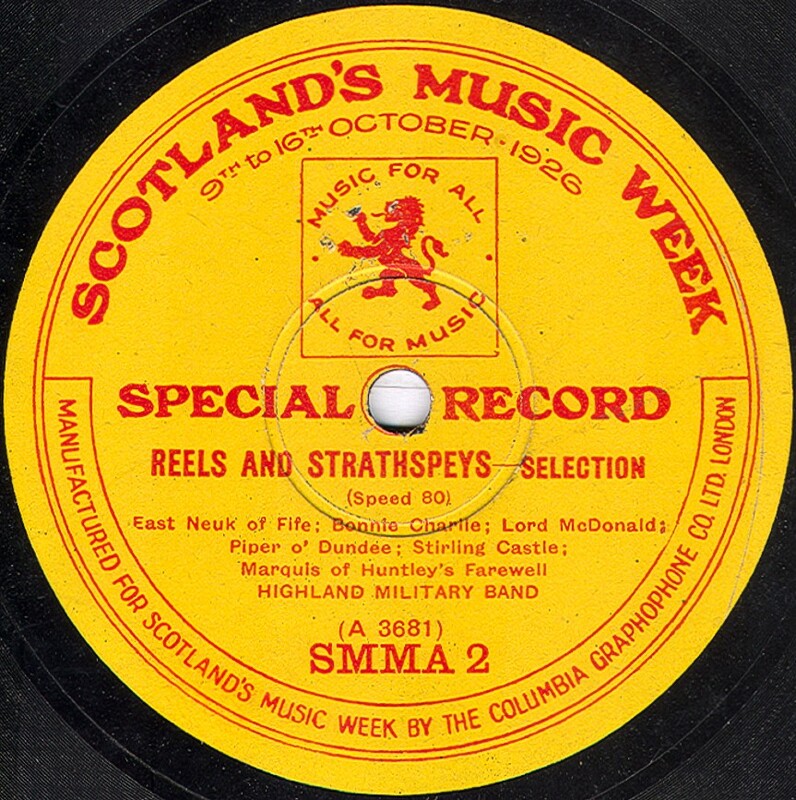 Scottish / Scotland's Music Week These two special records, dating from 1925 & 1926 respectively, were recorded and manufactured by Columbia to coincide with Scotland's annual Music Week. 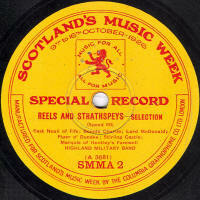 Scottish Records Dating from the late 1940s, there were produced by Douglas Grey of Aberdeen. 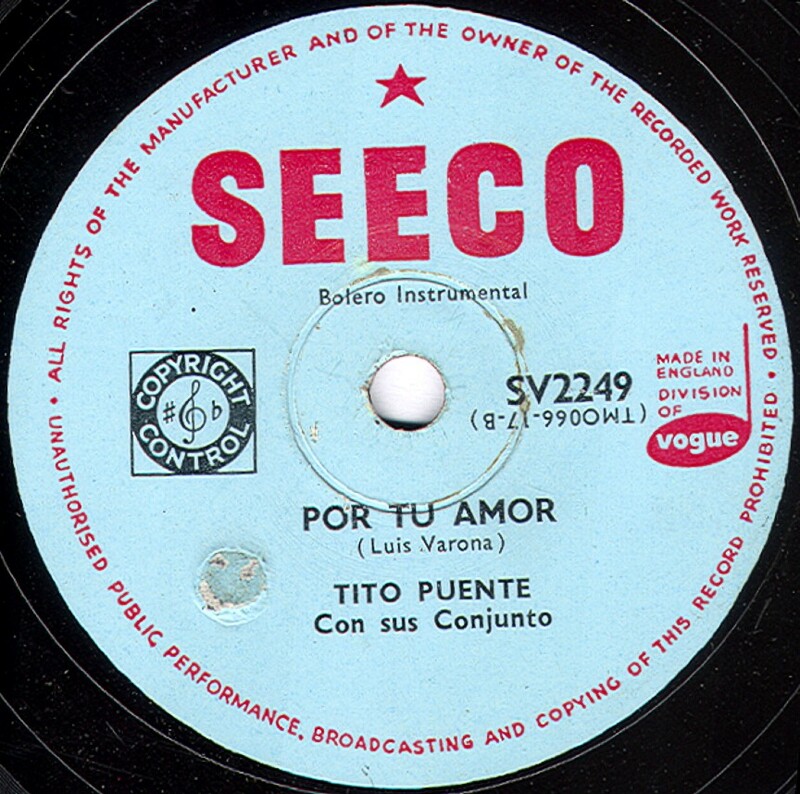 Seeco A product of Vogue records, Seeco records were available from 1954 to 1956, and the source for many of the recordings was Seeco records inc. of New York, USA. 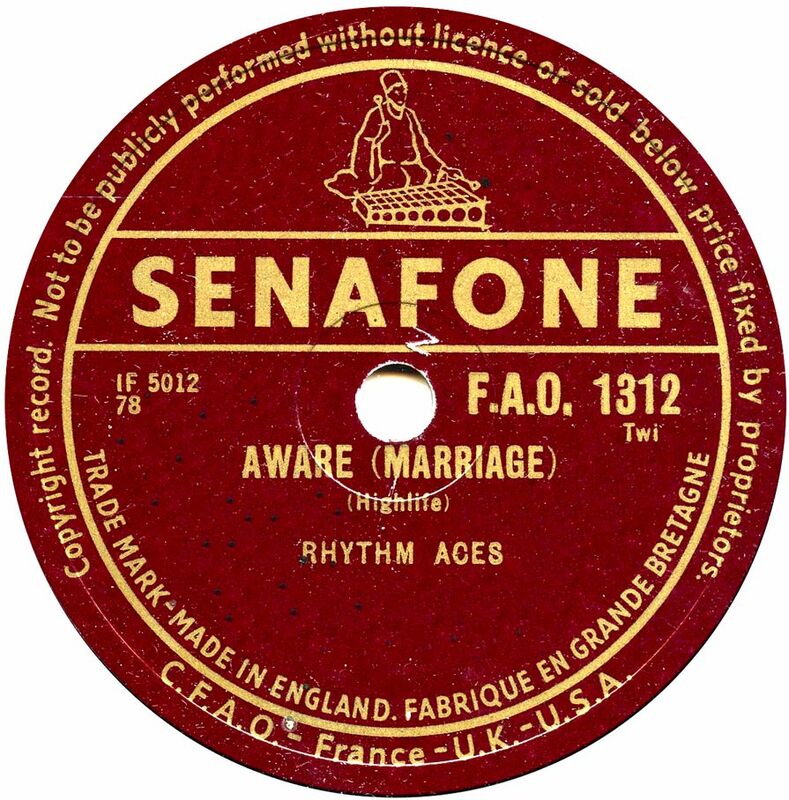 Sefono Sefono was a Durium / Hit of the Week product made for sale in France. Most of these were made in the USA. 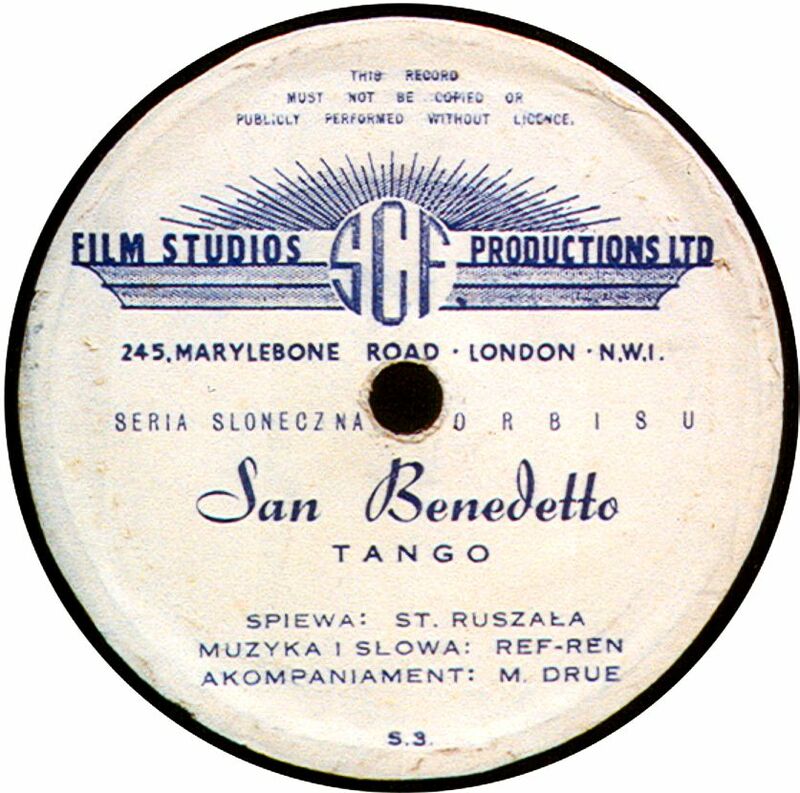 However, some Sefono records state "Fabrique a Slough (Angleterre)" (Made in Slough (England)). These have a 6000-series catalogue number and an F-100 matrix. The late Hans Koert, who researched the Durium products for many years, thought these may have been also recorded in London. The music on the known issues is all French. Selcol A 6" disc, dating from the early 1950s, produced for children. 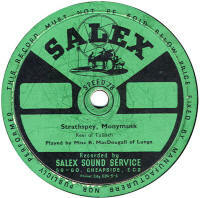 Pressed in plastic by Selmer Plastics of Braintree, Essex, but shellac versions have also been reported. 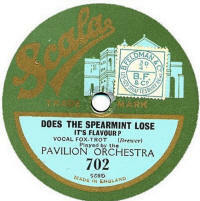 Selecta This is a series of 5 records, made by Parlophone in the late 1920s. 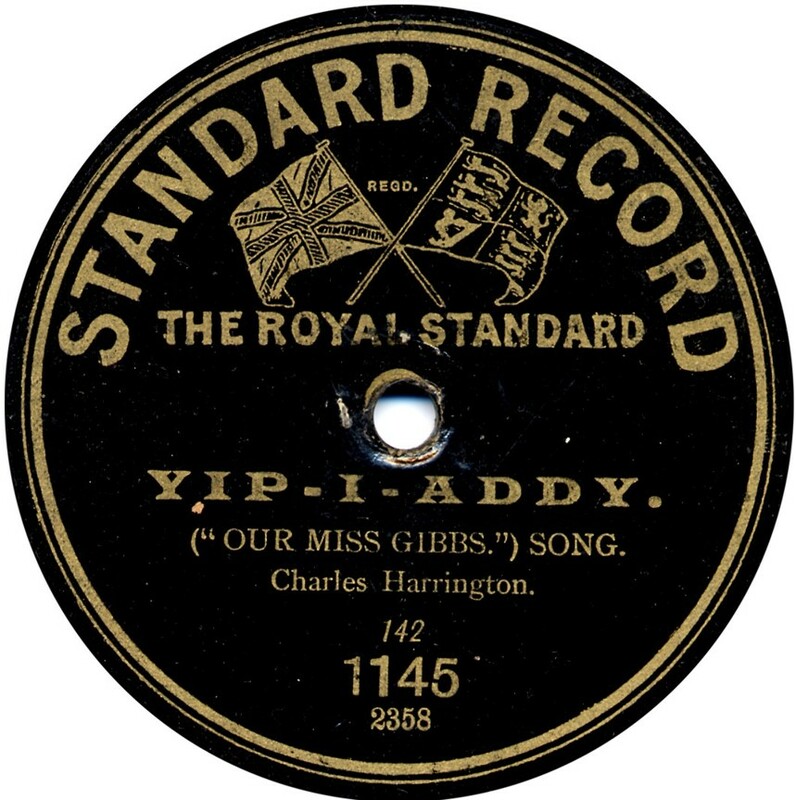 The records were produced for G.A. 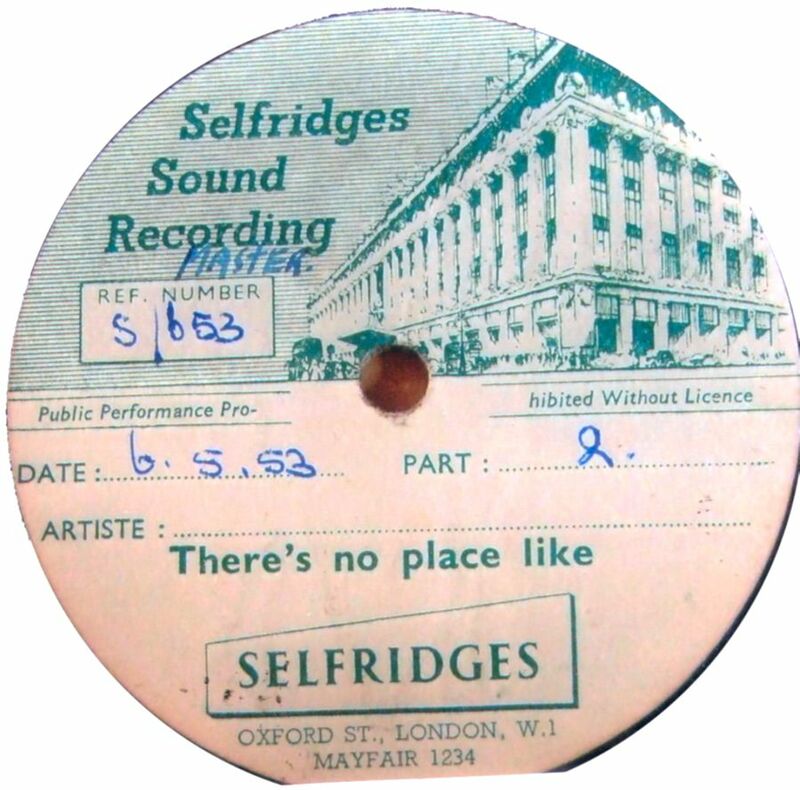 Bryen Ltd of 81, Southwark Street, London, who was the proprietor of Selecta Gramophones Ltd.
Selfridges No information on this label, but it implies that the Selfridges Store in Oxford Street, London offered a private recording service in the early 1950s. S.E.M.S. 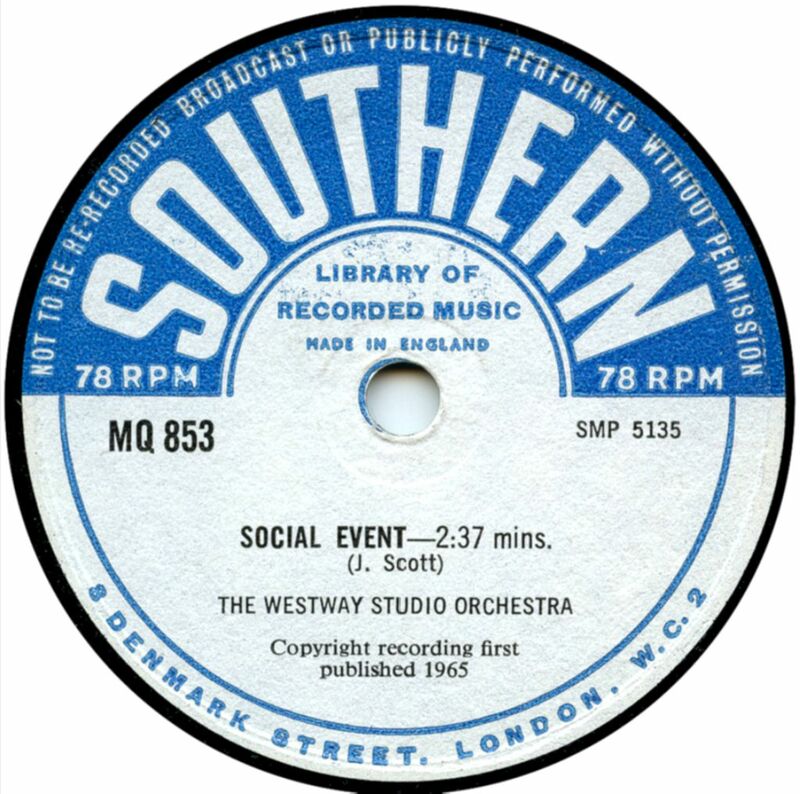 The initials stood for La Societe de L'Edition Musique Sacree, obviously a French concern, but the records were sold in the late 1940s & early 1950s by Neglected Masterpieces Recording Co. Ltd of City Road, London. Available in 10" ans 12" sizes. Senafone These were recorded by EMI in the 1950s. The reference on the label to C.F.A.O. in France, UK & USA is still a mystery. Shamrock This is an Irish label, sold by H.P. Fay of Dublin, the records being pressed from old "Edison Bell" masters, some of which were quite oild by the times the Shamrock records were produced, which was most likely to be the late 1920s or early 1930s. The examples seen have no catalogue numbers, and the original Edisdon Bell master numbers are generally, if not always, removedand replaced by Shamrock control numbers. 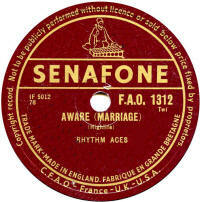 The labels state "electrically recorded" even when, as in some cases, the recordingsa are old acoustic ones. 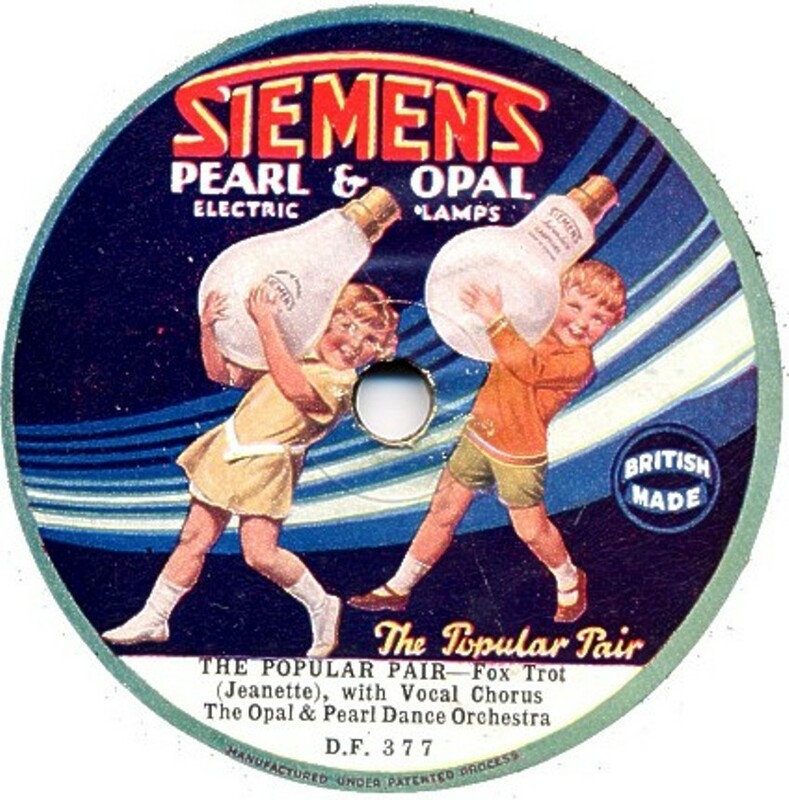 Siemens The was a one-off record to advertise SIemens' Opal and Pearl light bulbs. There's a certain amount of mystery about the record, but I would assume it was given away, probably at an exhibition. Although the record is not rare, it is unusual to find it in it's original sleeve. The mystery is that it has a catalogue number, which you wouldn't expect for a special issue. The record is of the "unbreakable" format, probably made by Worldecho or Duophone (both q.v.). 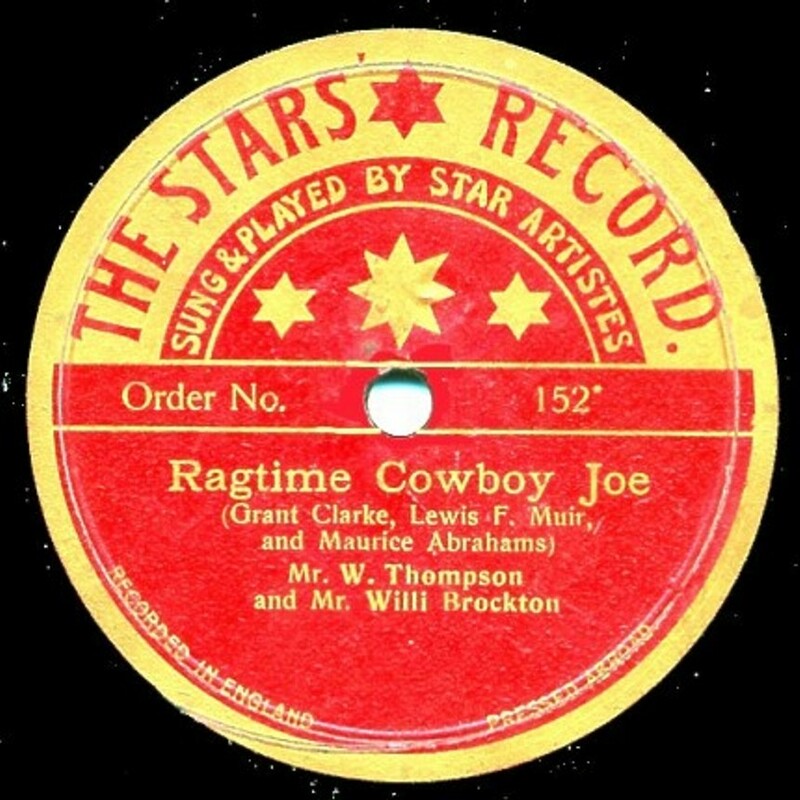 The vocalist, Eddie Grossbart, when interviewed towards the end of his life, maintained that many of the musicians on the records were members of Ambrose's Orchestra and indeed, one side is composed by "Jeanette" [sic], which is believed to be the reed player Joe Jeannette, from Ambrose's Orchestra of the period. Having said that, there is also a similarity of sound to Howard Godfrey's Band as well, and Godfrey remembered recording for "Duophone". As Godfrey's band at the Waldorf Hotel was only a 5-piece unit, on record it was enlarged by other musicians, and on this occasion it could well have included a large contingent of Ambrose's Orchestra. 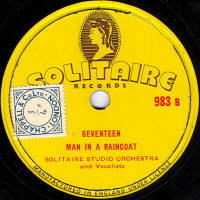 Silvatone These were 10" double-sided shellac records dating from 1934, which were offered for being played in public without a special licence, rather like Cinecord and Octacros. The records were advertised by Cairns & Morrison Ltd of Percy Street, London and they costs 2/6 each. 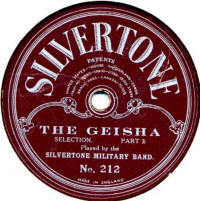 There were also 6" aluminium discs labelled "Silvatone Souvenir" which were also sold by Cairns & Morrison. Silvertone A British-made label dating from WWI, probably made at Lindström's Mead Works works in Hertford. The masters are believed to mainly from Lindstrom (i.e. Beka) and Jumbo and the label carries the patents of Odeon Records, who were part of the same group of companies at the time. 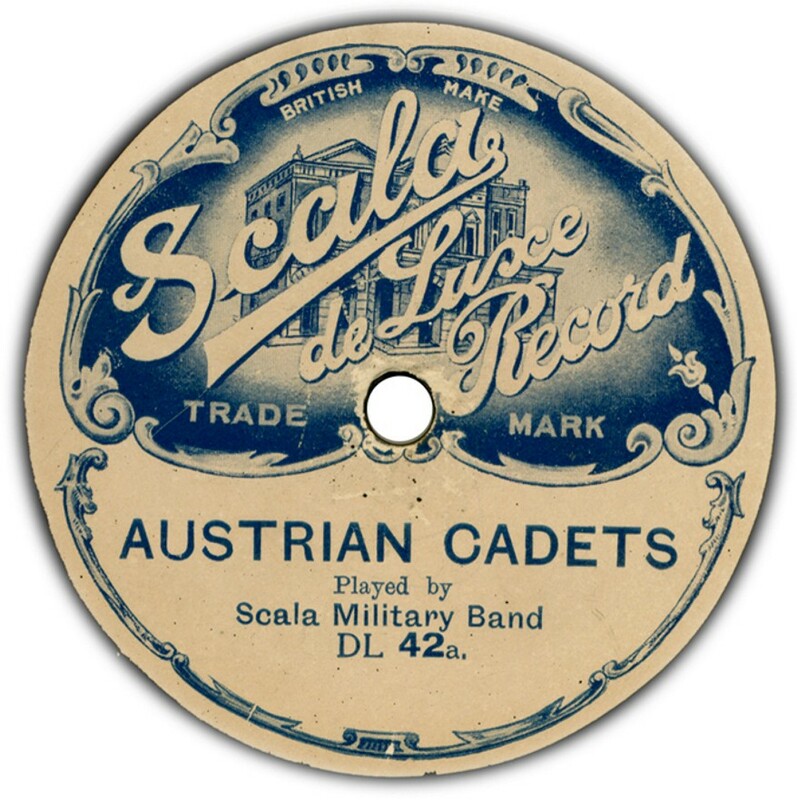 Frank Andrews tells us in "For The Record" No 51, that they were all issued as one batch in December 1916, by The Scala Record Co. but it is not known if they were produced for sale by a specific proprietor. If this is so, they were obviously over-optimistic as the catalogue numbering runs from 100 to over 500, and the records are very scarce - the listing here is petty sparse! 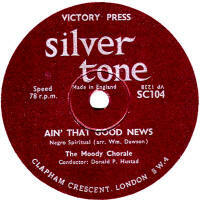 Silver Tone These were issued by The Victory Press od Clapham Crescent, London and date from the 1950s. The repertoire is of a religious nature. 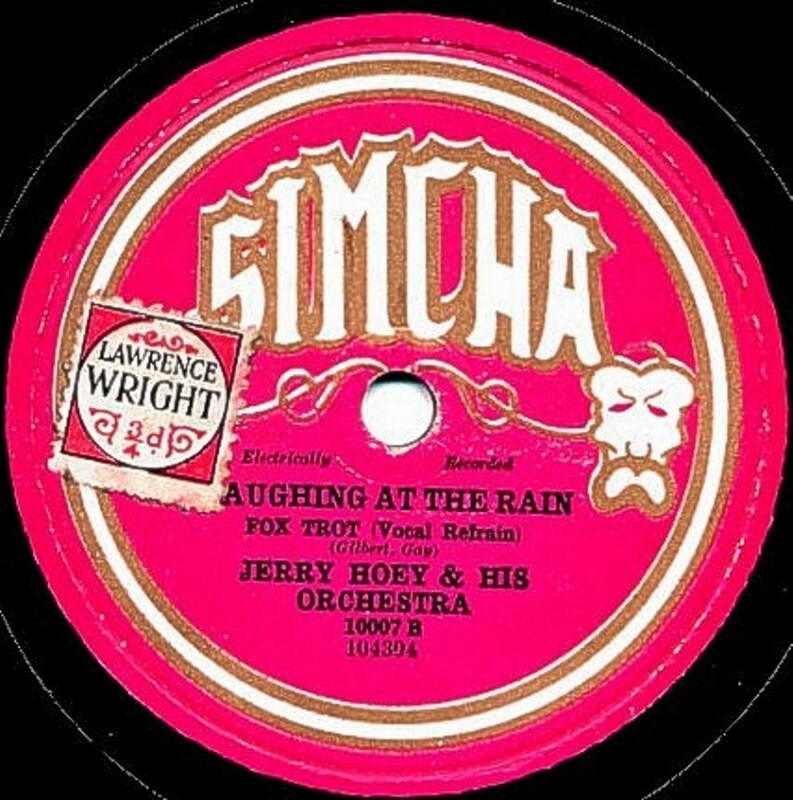 Simcha A short-lived label available in the early 1930s, Simcha drew its masters from Piccadilly, including some American Grey Gull items. Simcha is a Hebrew word meaning Joy or Gladness and is pronounced "Simka" (i.e. with the -ch- pronounced as a -K-.). The records were presumably made for a shop or store, but I don't know which one. The main catalogue series was in a 10000-series and just over 50 were produced. In addition a Jewish series in the A-100 range was issued. Singer These were made by Decca in Englkand for Gallo Ltd of Africa . 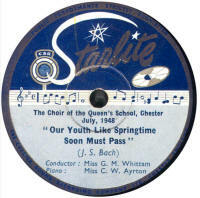 The tunes on this record date to the mid-late 1930s so the record dates to about that time, or maybe later. Sinophone This label was sent into the editor of "For The Record" No. 28, from a member in Hong Kong, but nothing more is known about it despite it being "Made in England" according to the label. S.L.R.C. Dating from the late 1940s, these were issued by Hume & Addison of Manchester on behalf of The South Lancs. Rhythm Club. 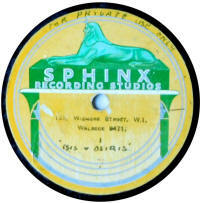 The records show no catalogue or matrix numbers on the labels, but the matrix number "in the wax" has an SSS- prefix. Smith A very obscure regional label dating from the WWI period. 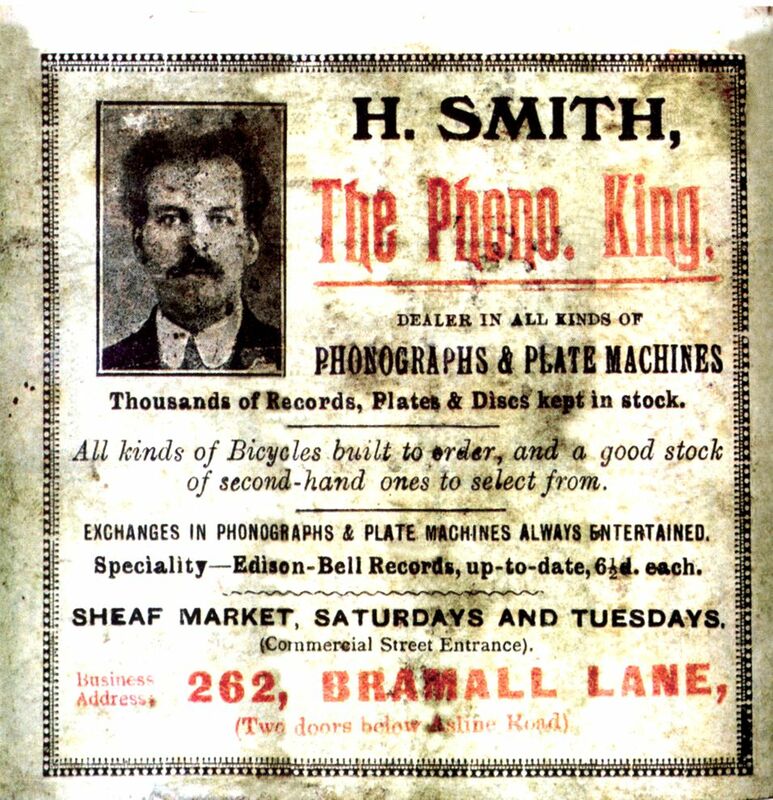 Smith records were sold by Herbert Smith, both at his shop at 262 Bramall Lane and at the twice-weekly Sheaf Market. From the 1906 dealer label seen here (thanks to Steve Walker for this), he, like many dealers at the time, sold bicycles and gramophonalia. 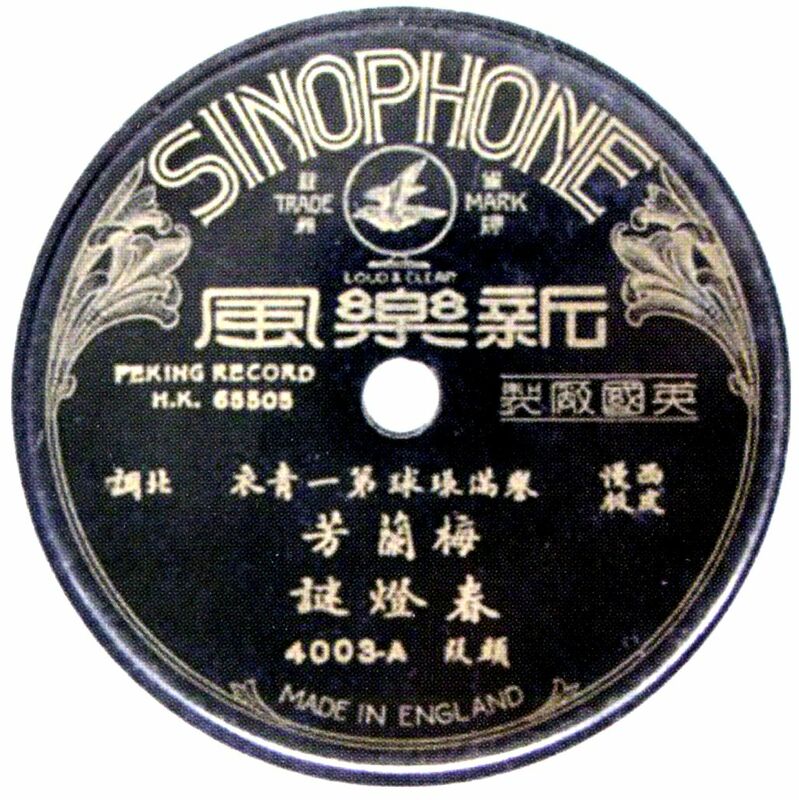 The label refers to phonographs, plate machines (gramophones) and the associated records (cylinders) and plates (disc records). He also sold own-produced bicycles under the name "Sheffield-Langsett". Based on the solitary "Smith" record found, they were pressed in the UK by Crystalate from Grammavox (Sound Recording Company) masters and had no catalogue numbers, just using the matrix numbers to refer to each side in a similar manner to early Grammavox records. Selling his own-labelled records may have been an experiment which didn't work, judging by their scarcity. 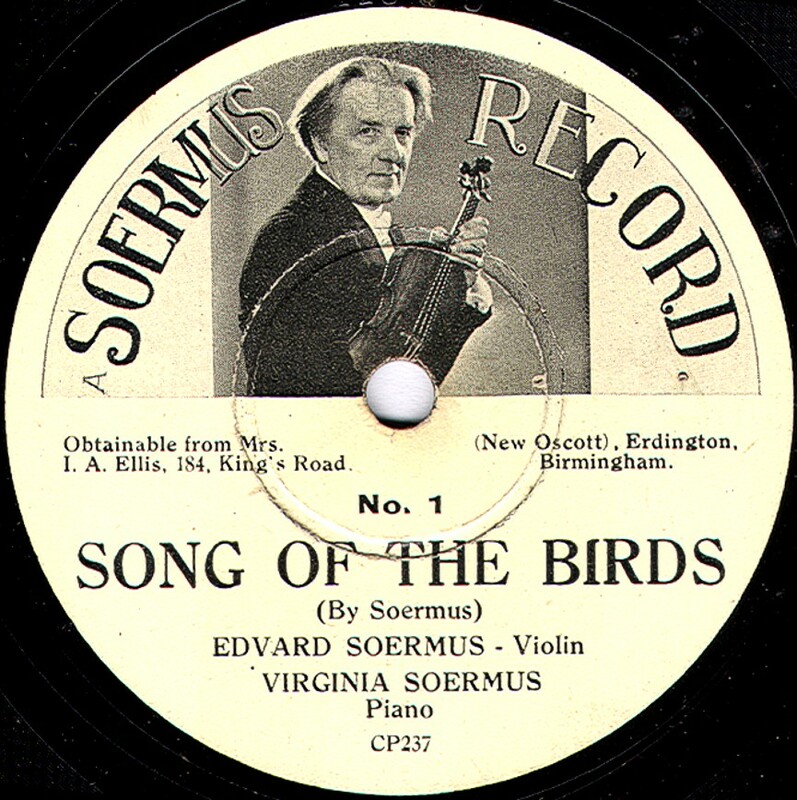 Soermus All of these records are by violinist and composer Edvard Soermus (1878 - 1940), but it is not known how many different ones were made. On the one shown here he is accompanied at the piano by his wife, Virginia (who was British). 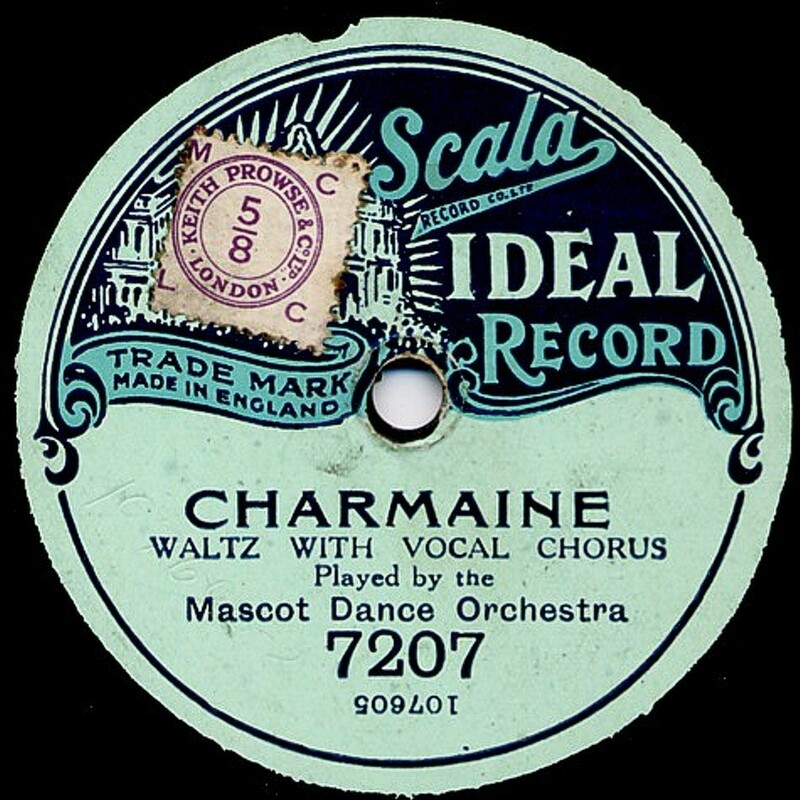 The records date from about 1934 and were recorded and pressed by Crystalate for sale by Mrs Ellis of Erdington, Birmingham. 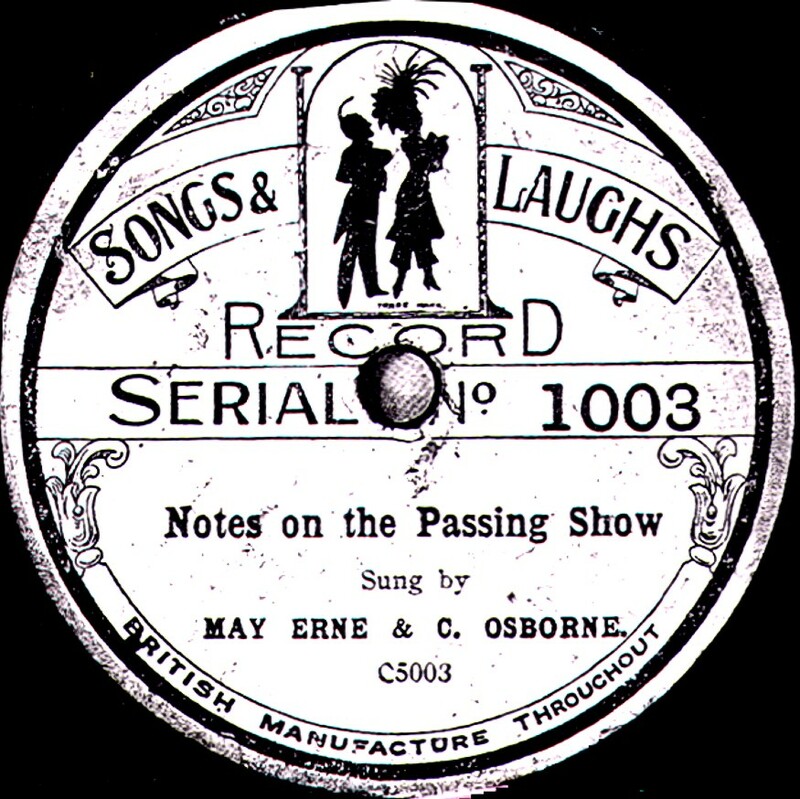 The recordings (and presumably the records) date from about 1934. 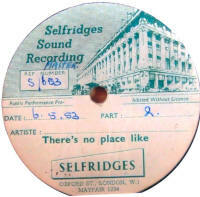 Solex British Homophone made Solex records. They were initially an 8" disc with a very fine groove, allowing playing time equal to a 10" disc, without getting too near the label. 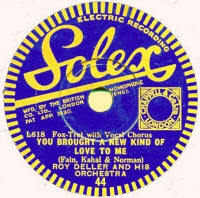 Solex was BH's first 8" disc, being available in 1930 & 1931. Catalogue numbers started logically at 1 and ran to about 70. 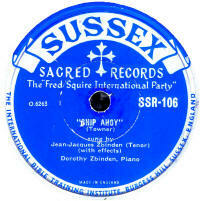 In 1935, BH revivied the name for a short-lived 10" disc with a catalogue series starting at SX-101. The patent mentioned at the top of the label refers to the strobe design around the edge of the label, which was subsequently adopted by most of the British Homophone labels. 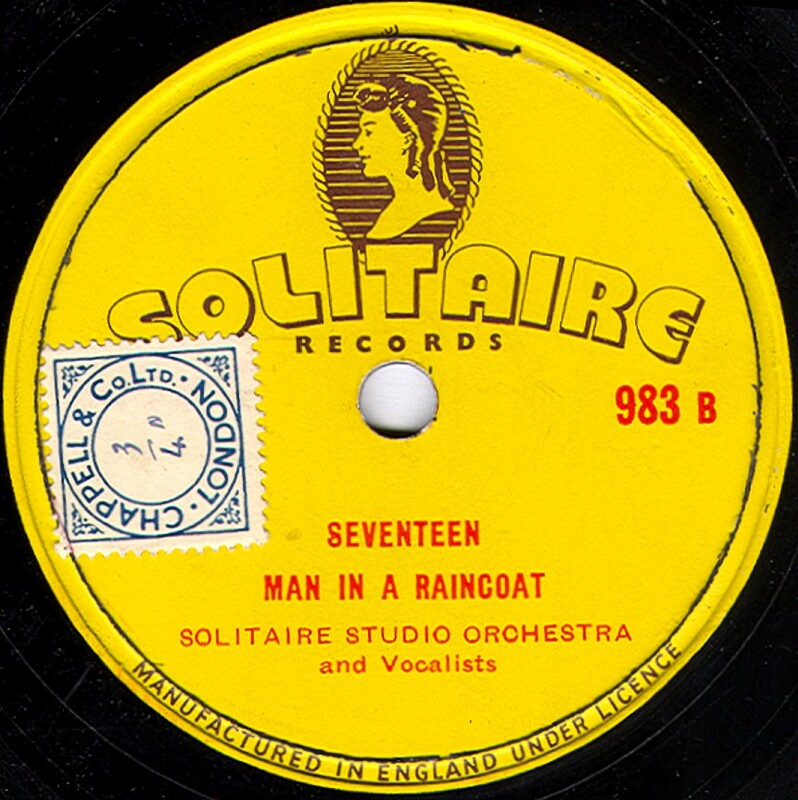 Solitaire Dating from about 1955-56, and usually pressed in vinyl, these were cover versions of current "pop" hits and generally had two full-length popular tunes each side, sometimes by different artists. 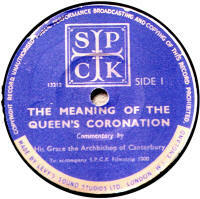 The recordings were from both Britain & the USA. 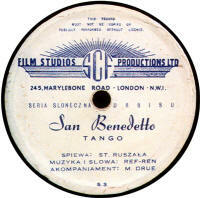 They were distributed by Recordiscs Ltd of 23, Great Pultney Street, London W1. 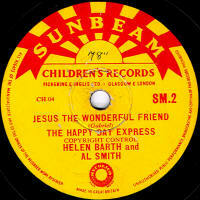 10" LPs were also issued under this label. The 78s sold for 5/6, the LPs for 13/8. 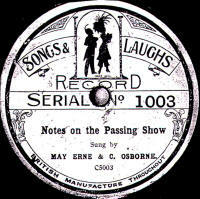 Songs & Laughs Although only a monochrome copy of the label is available to view here, it gives the appearance of Bulldog records of pre-1920, and indeed "The Passing Show" dates from 1914. 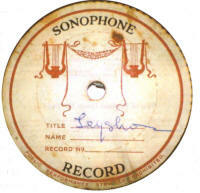 Sonodisc These records date from the 1930s and were produced by Sonodisc Ltd, as language courses, similar to Linguaphone. 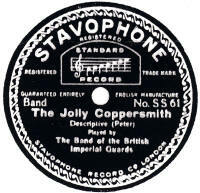 The records were recorded & manufactured by Crystalate Ltd (as were Linguaphone at this time). 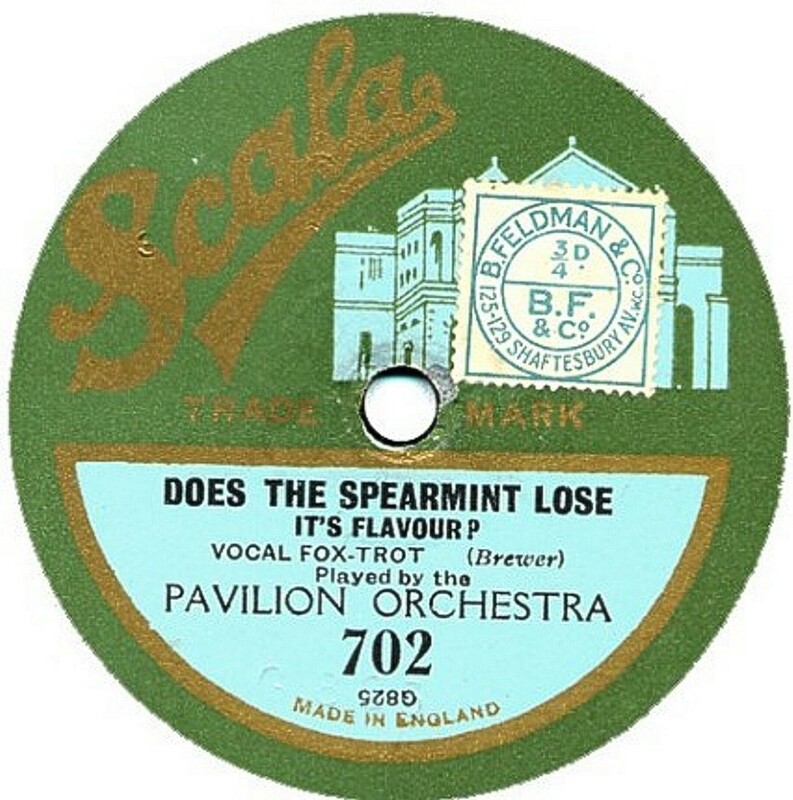 After Decca took over Crystalate in 1937, Decca took on the recording side and the records were then pressed by The Linguaphone factory in Slough. 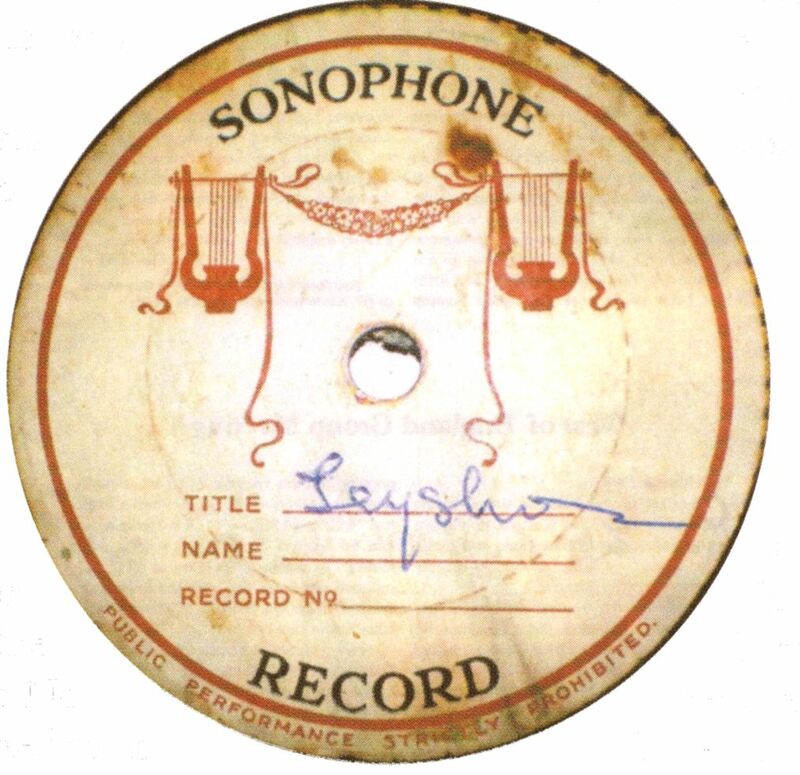 Linguaphone eventually took over Sonodisc entirely in 1964. Sonophone Nothing is known about this label. The only example reported (seen here) is of Leyshon Watkins, a Welsh boy treble, though at the time of this recording, his voice is described as a light tenor. 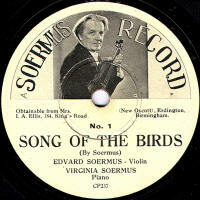 Based purely on this information, it is conjectured that Sonophone was a Welsh private recording company. Sound Recording Committee Strictly speaking, these are outside of my scope, since the records are speed 24rpm. 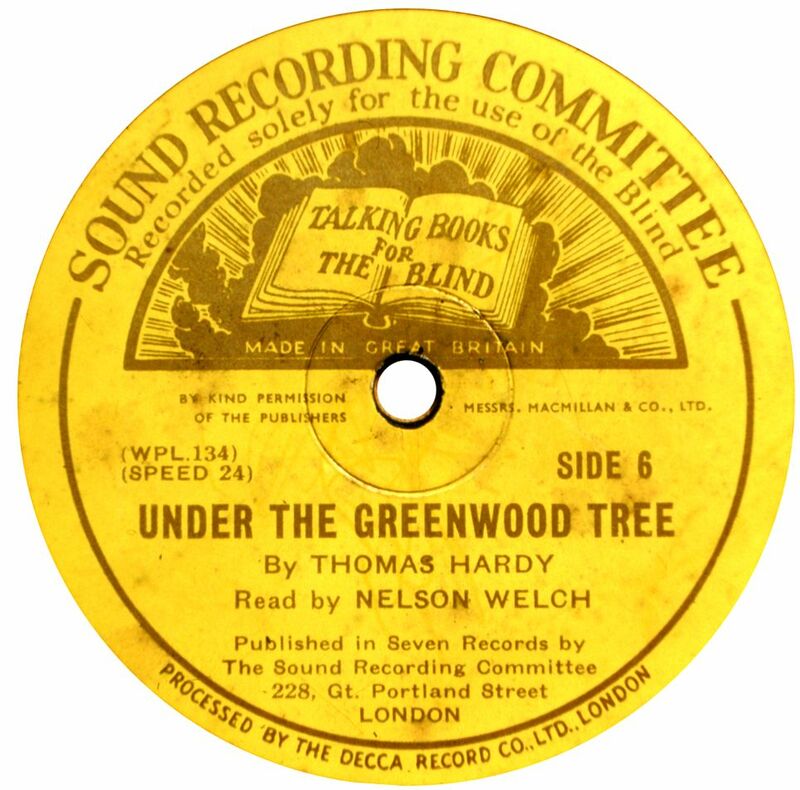 This company issued talking books for the Blind. 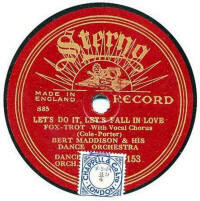 The records date from the mid-1930s and were 12" size and manufactred by Decca. Soundwave One of the many pre-WWI labels pressed in Germany for the British market using masters from J. Blum & Co and possibly Polyphon. There are two series, possibly using two difference sources for masters; the records themselves are very scarce. 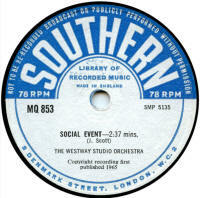 Southern The Southern Music Publishhing Company were formed in 1932, but they didn't start having records made of their library music until 1960. 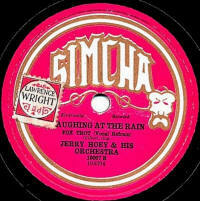 These 78s, which were published until 1969, were always pressed in vinyl. It is not known who recorded and pressed these records. The catalogue number started at MQ-501 in 1960 and Frank Andrews reports MQ-962 in 1969. The matrix numbers are in an SMP-series which doesn't help identify the recording company. 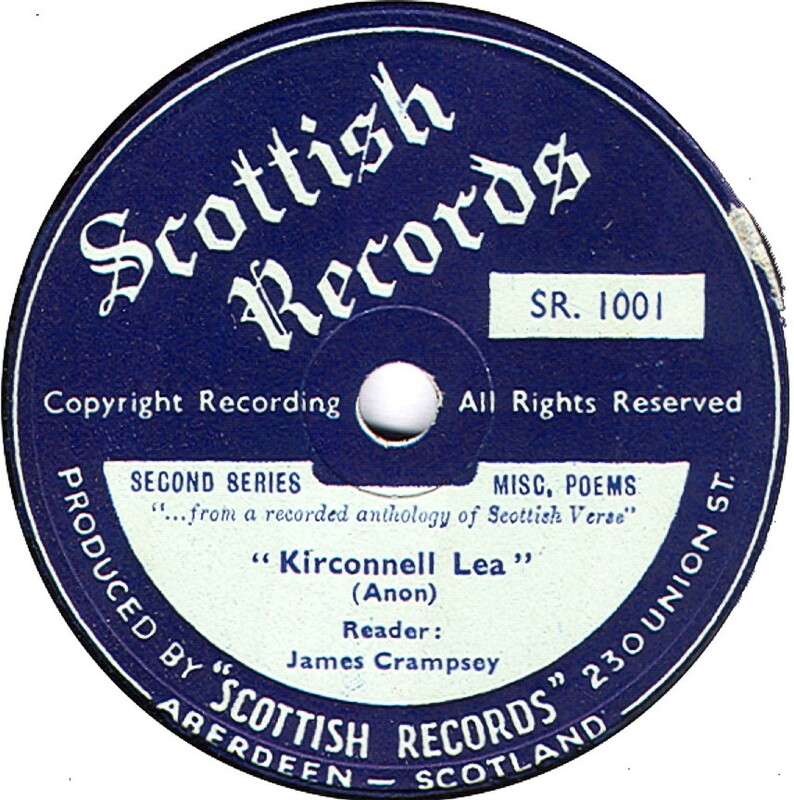 Sovereign A very short-lived and early disc record which appeared in 1907 for a few months, Sovereign were 10" double-sided and used Nicole masters and were manufactured from the same "unbreakable" material as Nicoles had been, but in black rather than brown. The labels state they were made by the British Sonogram Company. This was effectively a subsidiary of John Watson Hawd's Disc Record Company of Stockport. Hawd had purchased the machinery & masters from Nicole Freres when the company went into administration. Sovereign Records sold for 2/- each. The British Sonogram Company advertised new recordings on the Sonogram Record label, but these have never been seen, and may never have actually appeared. 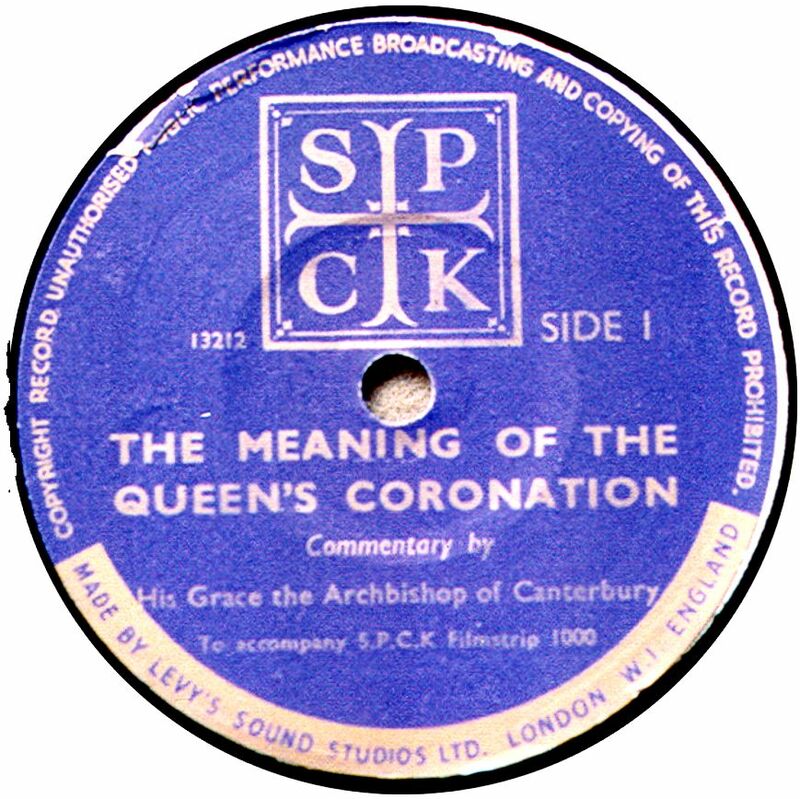 SPCK This was a record produced for The Society For The Promotion Of Christian Knowledge. This was an ancient society, founded in 1698. 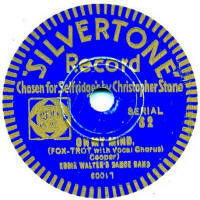 The record (probably a one-off) dates from 1953. 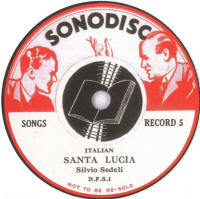 It is not known who recorded it, but Levy's Sound Studios pressed them in vinyl. Special Record There were many records labelled in this manner over the years. I will try to gather as many examples as I can and try to explain them. 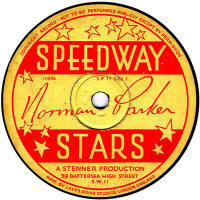 Speedway Stars This was a series of 8" double-sided records of Speedway Stars who were competing in The National Speedway League. 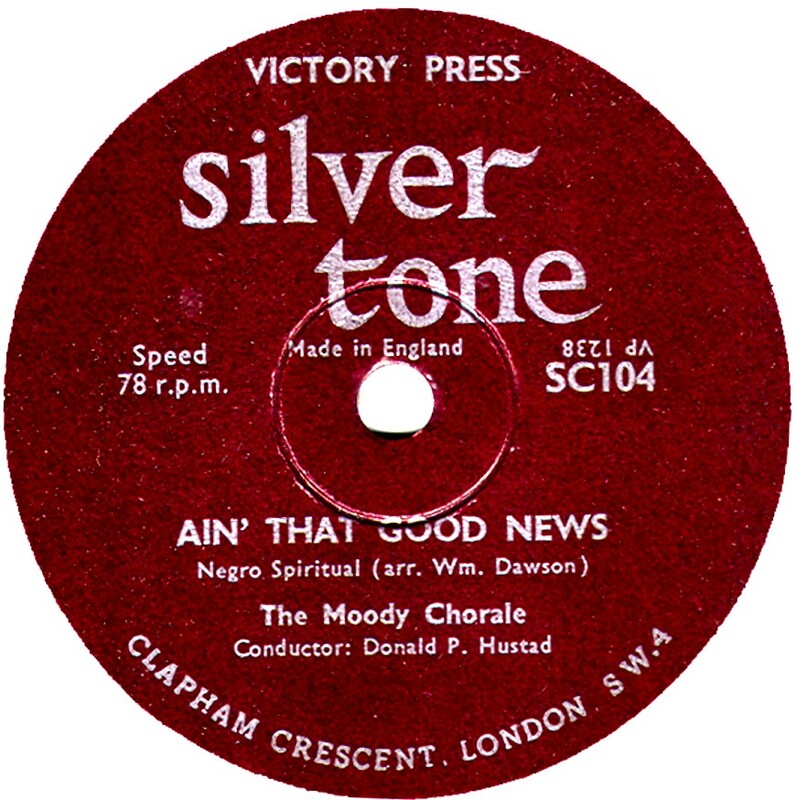 The recordings were made by Levy's Sound Studios and the records made by Stenners of Battersea High Street, London. The discs had an SP-series catalogue number, probably starting with SP-1. Frank Andrews does not give a date for these records. The one illustrated is SP-11, with matrix numbers 11096 & 11097, by Norman Parker. I would be interested to know details of any other records n this series. 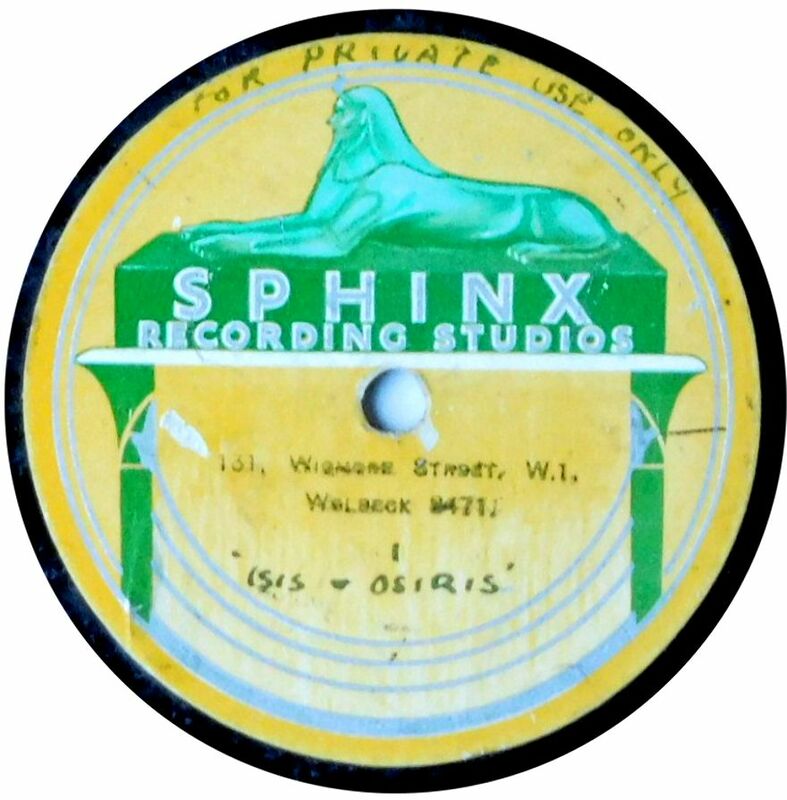 Sphinx Thanks to Bill Dean-Myatt for providing the label image. 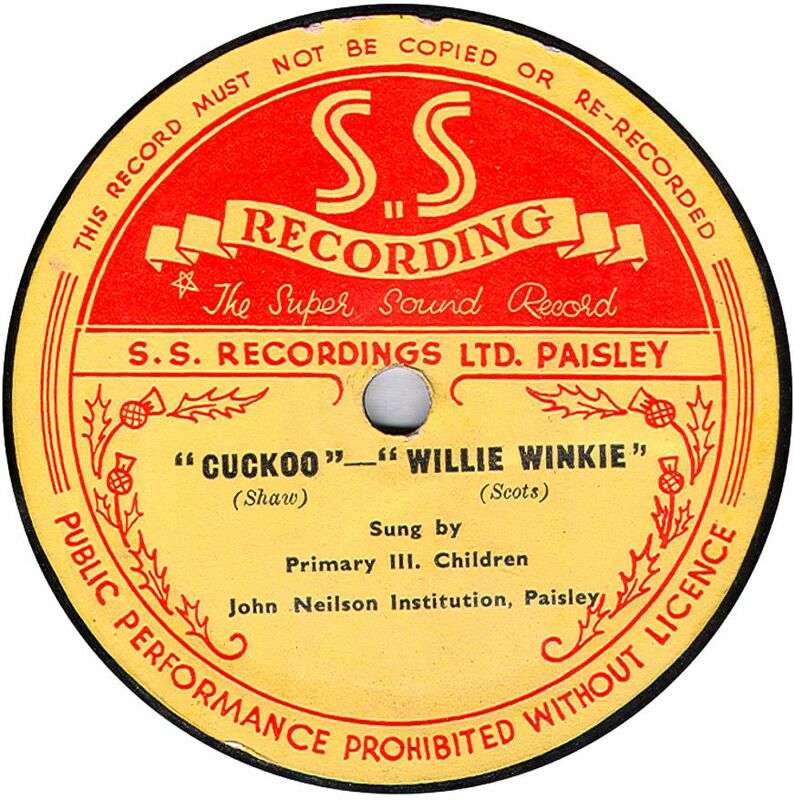 S.S. Recording This was a private recording concern, Super Sound Recording, based in Paisley, Scotland. The examples seen have no catalogue numbers, but do appear to be solid stock pressings, but of an unknown date, probably the 1950s. 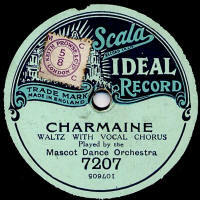 Standard A rather obscure pre-WWI record label. In fact, there may be two labels, but I don't know if there is any link between them. One was pressed by Edison Bell using their "Bell" masters (seen here) and the other was a product of the Sound Recording Company. Both companies were using 10¼" masters at the time. The second image is of another Standard label which was pressed by Crystalate in the 1920s using masters also available on their Imperial records. (U.S. 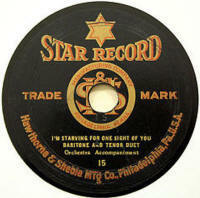 Import) The first "Star" record sold in Britian was an American import arriving from September 1907. It was a stencilled disc, i.e. the masters used were from other record companies. In this case from the American Record Company or from Columbia. 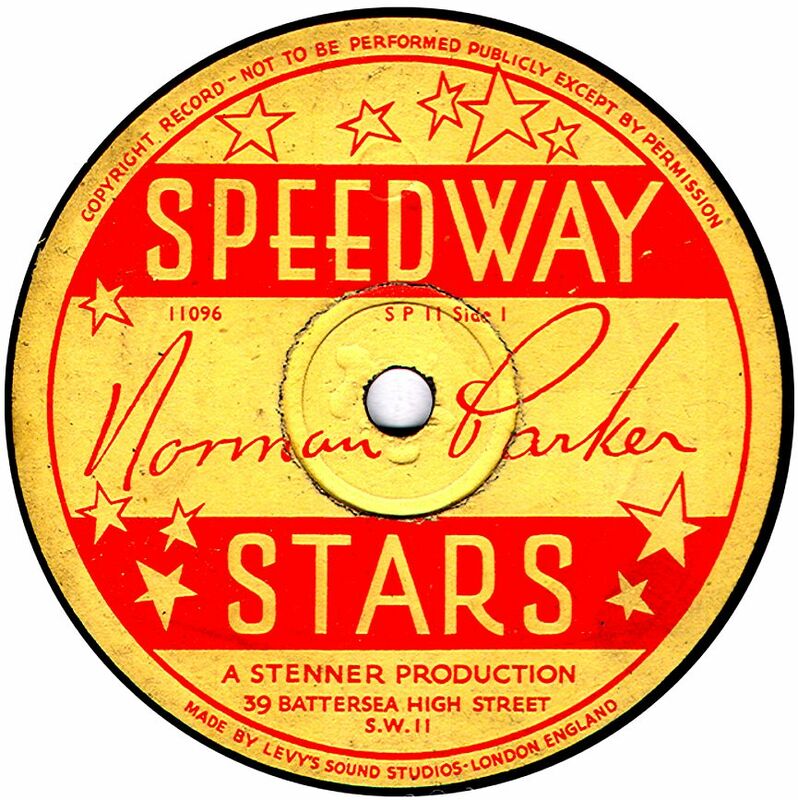 Since there were no language issues, it is assumed the Star records sold in Britian had the same label design as the American ones, as shown here. The original label was purple, with a white design, red titling and a five-pointed star logo. This was available in both 10" & 12" sizes record using old ARC's masters with 03000 series numbers. The catalogue numbers started at 1201 for the 10" and 5000 for the 12". Later matrix numbers in a 2000- upwards series were newly recorded masters for Hawthorne & Sheble. H&S went bankrupt in June 1909 and then Columbia took over production. 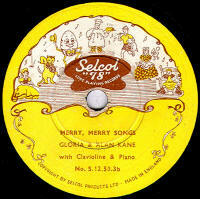 Columbia's label design was black, with a gold and red design and a 6-pointed star, also available in 10" and 12" sizes. Whether the Columbia ones were imported to Britain, I don't know, but I include an image here just in case. Columbia stopped producting Star records in early 1910. 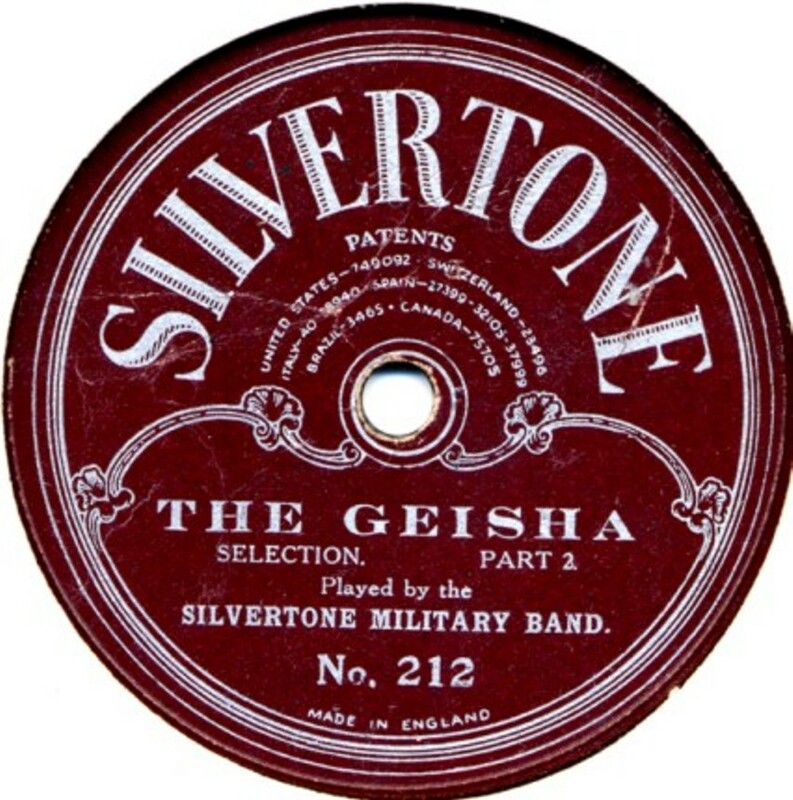 They were imported by The General Phonograph Company, who had offices at 1 Worship Street, London (and also dealt in Neophone records). I have no prices, though they would probably have been relatively expensive due to the importing costs. Thanks to Bill Dean-Myatt for the first label image. (U.K. made) One of the many labels pressed by Edison Bell in the years before WWI. 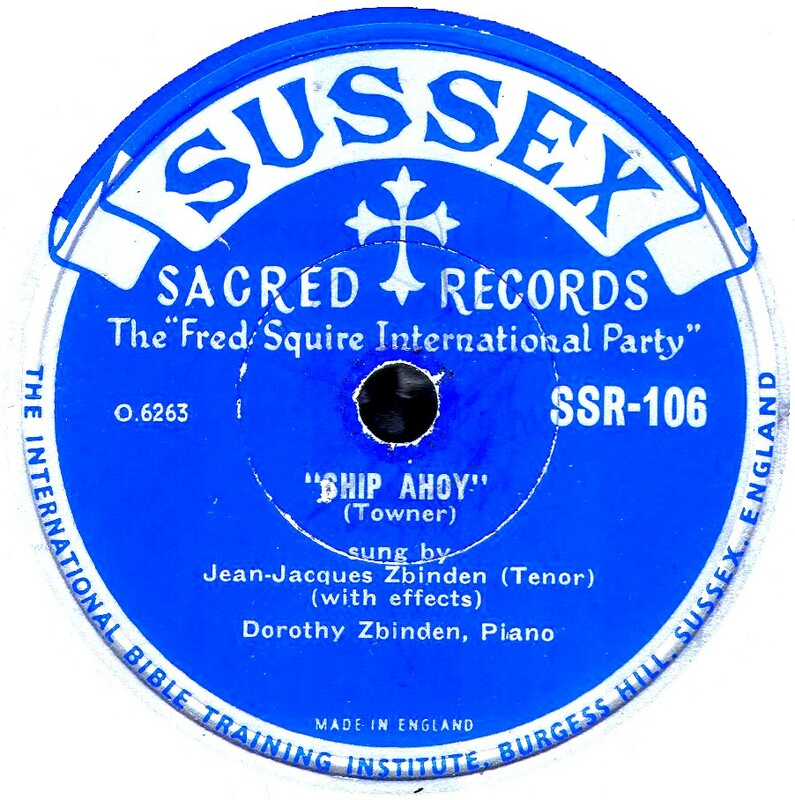 The records are very scarce and Fank Andrews didn't even know about its existence, so we can assume it was not mentioned in the British trade press. In which case, we can only assume for now that they were made for Export only, and I can only approximatley date it to sometime after 1909. Catalogue numbering presumably began at 1. Please e-mail me with details of ANY of these records. Thanks to Rainer Lotz for providing the label scan. Stardom These were 10" discs with gold & blue labels producted for Fidelity records, of 18, Regent Street, Weston-Super-Mare. 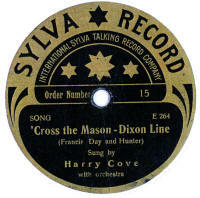 The master numbers imply they were recorded by Oriole records (Levy's). 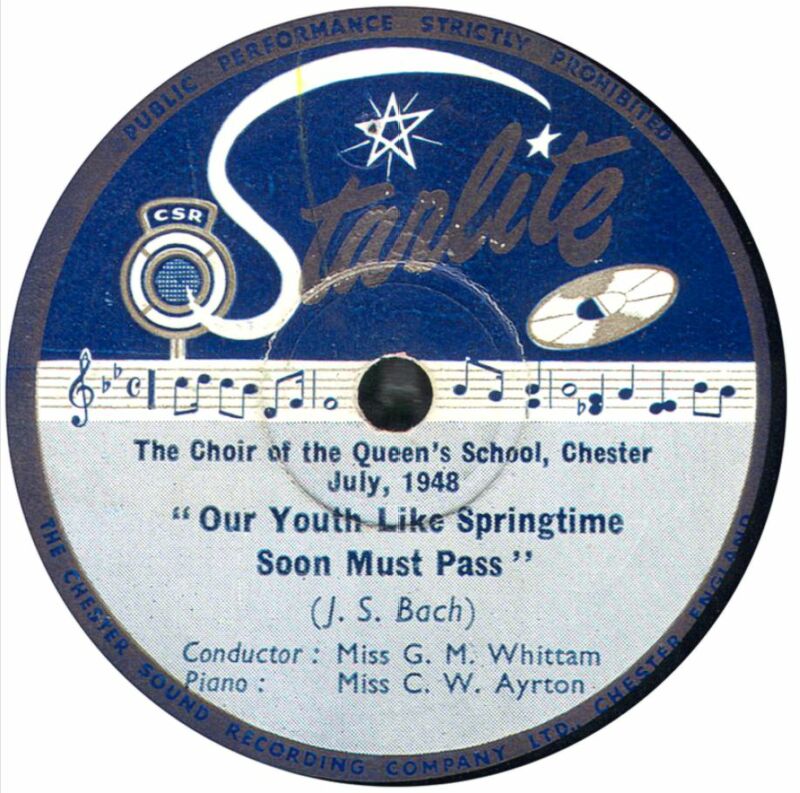 Starlite These records were recorded by Chester Sound Recording Co Ltd and date fromn the late 1940s. 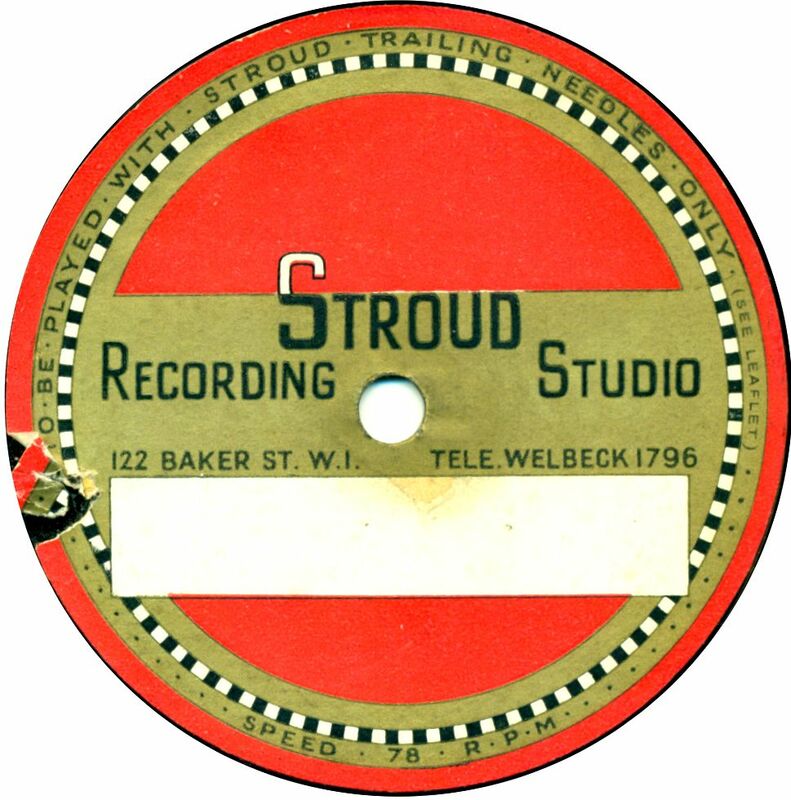 Star Sound Studios This was a private recording service based in Cavendish Square, London W1, starting in the late 1930s. The facilities were regularly used by the BBC, as the company had a very large studio which was suitable for large orchestras. 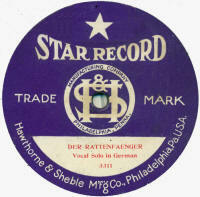 The Stars The Stars Record was a pre-WWI record made in Germany which used Polyphon masters. Sometimes the label is just a "paste-over" on existing Polyphon or 'Heraldic' records. The reference on the label to "Star artists" would seem to be a very early reference to the word "Star" meaning "celebrity". Stavophone A cheap record (costing 1/1) produced by the Sound Recording Co in 1913 (and pressed by Crystalate). 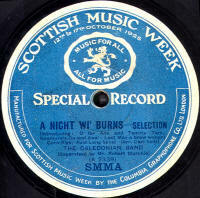 This record was announced in the trade press at the time (along with the first monochrome image shown here), but no records have been reported in recent years. Because of this, it had been thought that maybe they never actually appeared, but the second image shown here, albeit STILL from a monchrome photo-copy, does show a needle scratch across the label, proving the image was taken from an actual record. Thanks to Joe Moore for providing the first image shown here, and Bill Dean-Myatt for the second. 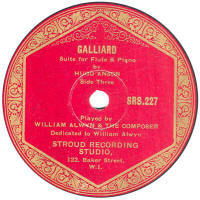 Stella Yet another pre-WWI record produced for J. Blum & Co. Like Diploma, this one used masters from the German Kalliope company. 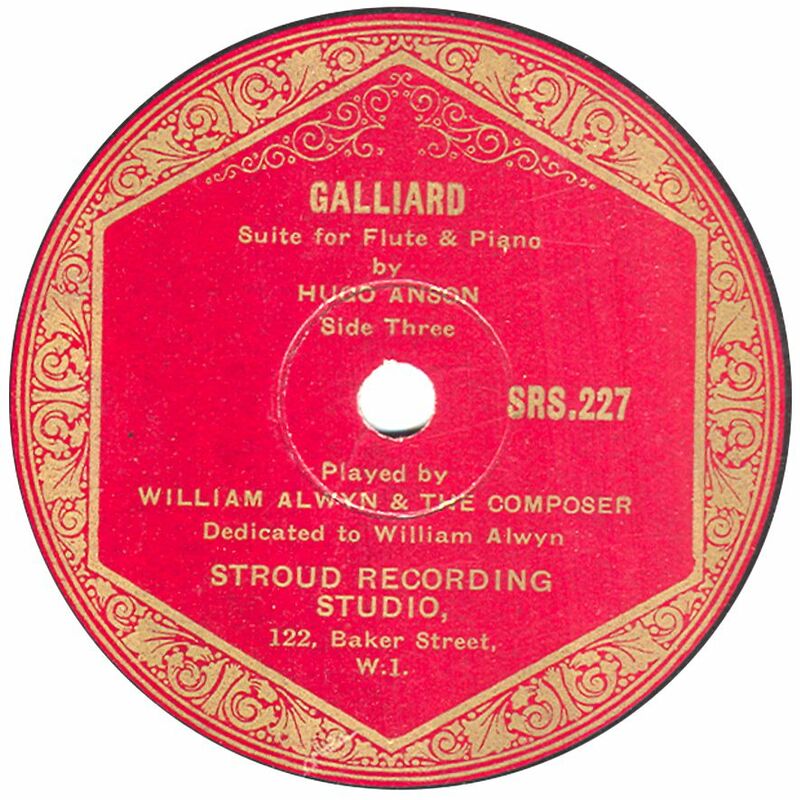 judging by surviving examples, the company ran into copyright problems as the name had alrady been registered by Pathe Freres, and it is rare to find an Stella-Gramophone Record (to give it its full name) which hasn't been "amended". 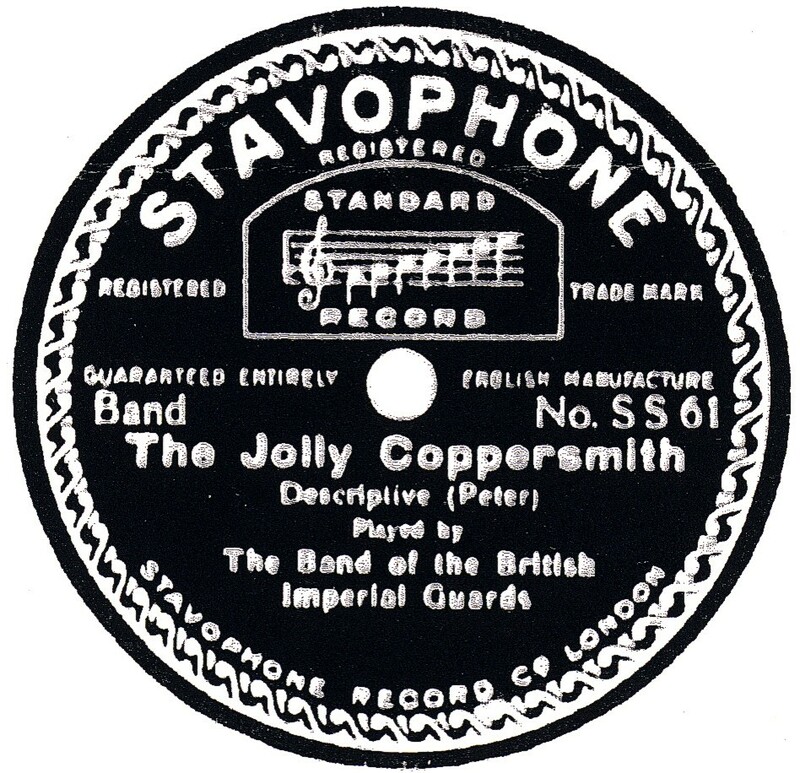 Some have the word "Gramophone" scratched out, and other have a label printed with "Victory" stuck over the word "Stella". The catalogue numbers have various prefixes, such as A- and C-, followed by a 1, 2 or 3-digit number. The label name was subsequently changed to Victory. 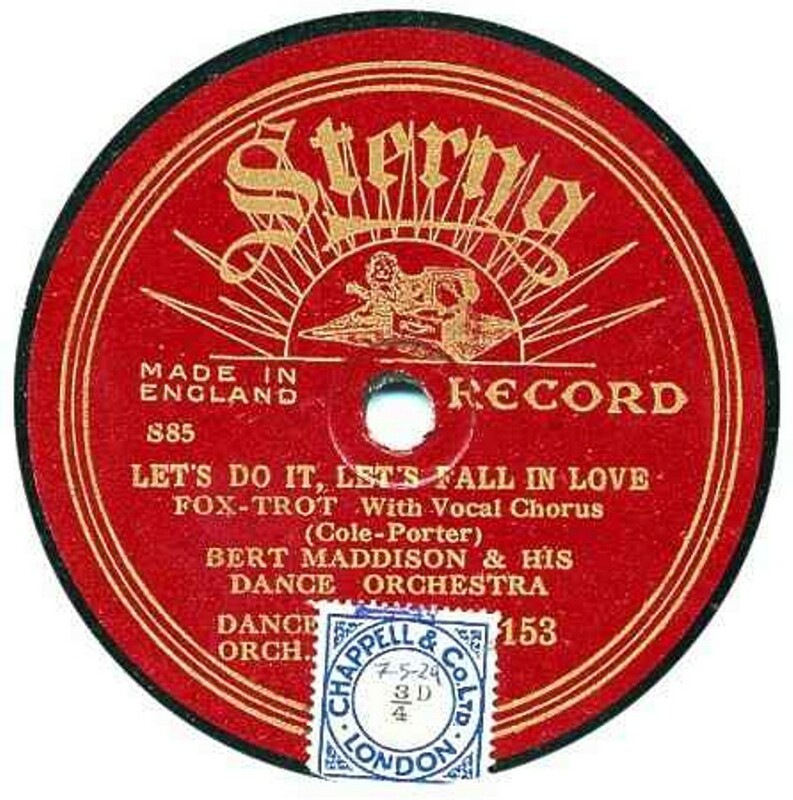 Sterno Sterno records were produced by the British Homophone Company between 1926 and 1935, originally as a cheaper equivalent of their Homochord label. 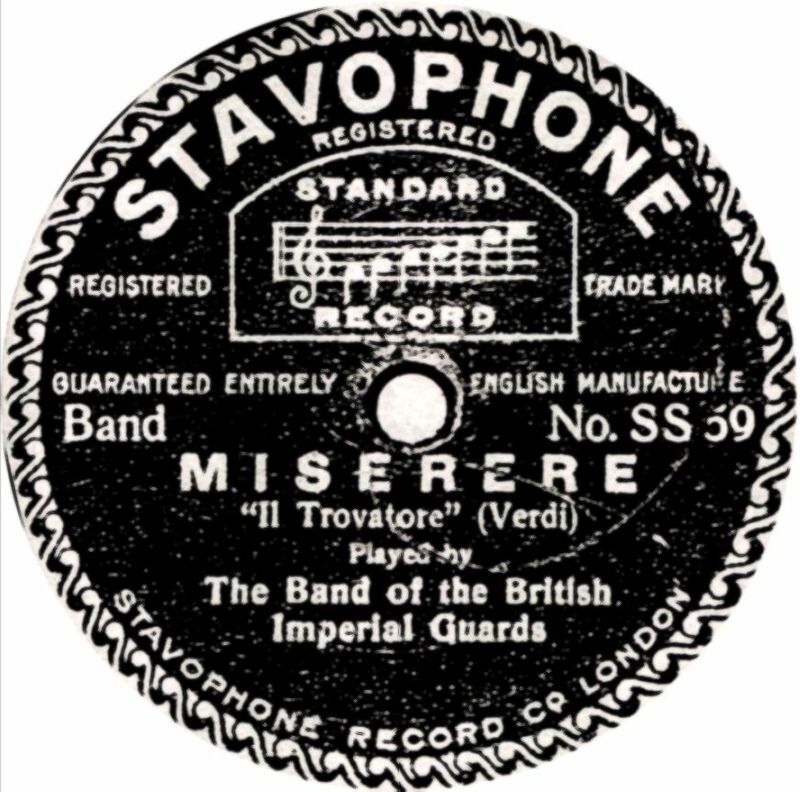 The first Sternos are very scarce and were recorded & produced by the Gramophone Company to a very high standard, but it is not known who sold them. They are scarce and may have been produced for export only. 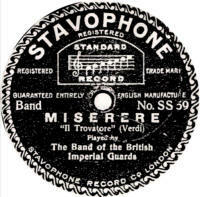 Subsequent red labelled records, introduced in 1929, were recorded by BH Co for Sterno and vary enormously in recording quality and surface noise. Almost all used British masters, and later many good dance bands recorded for Sterno, but they sold poorly. They were manufactured at the old Pathe factory in Stonebridge Park, London. The name derived from The Sterno Manufacturing Company, of which David Sternberg was the owner. 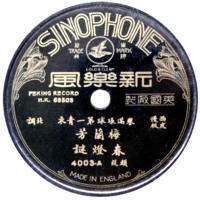 He formed the British Homphone Company. 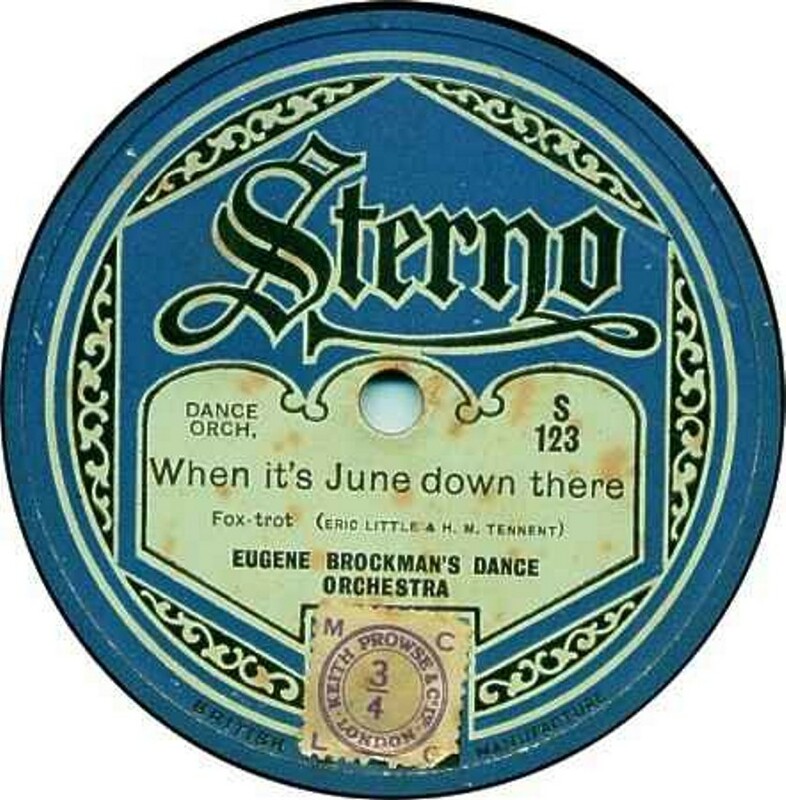 Sterno Baby A 6" disc produced by the Gramophone Company for British Homophone in the mid-1920s, using the same masters as "Homo Baby" and "Dixy". Sterno Baby is somewhat scarcer than either, with a catalogue series in a 1000 range, running from 1001 to 1015. The recordings are all acoustic and the dance records are played by an orchestra and in a style more suited to playing overtures and marches. My thanks to Dave Mason for providing the label image. Storey's This was a private recording studio, operating in the late 1930s from 57, West Ham Lane, Stratford, London. 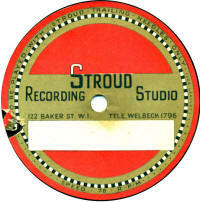 Stroud Recording Studio This studio was based at 122, Baker Street, London and founded by Leslie Stroud in the mid-1930s. Stubbs & Kitchen This was a private recording company at Valderbilt Court Studios, 8 Victoria Street Harrogate, Yorkshire. They were providing a service by June 1935 with single & double discs of 6" size, which gave just one minute of playing time. 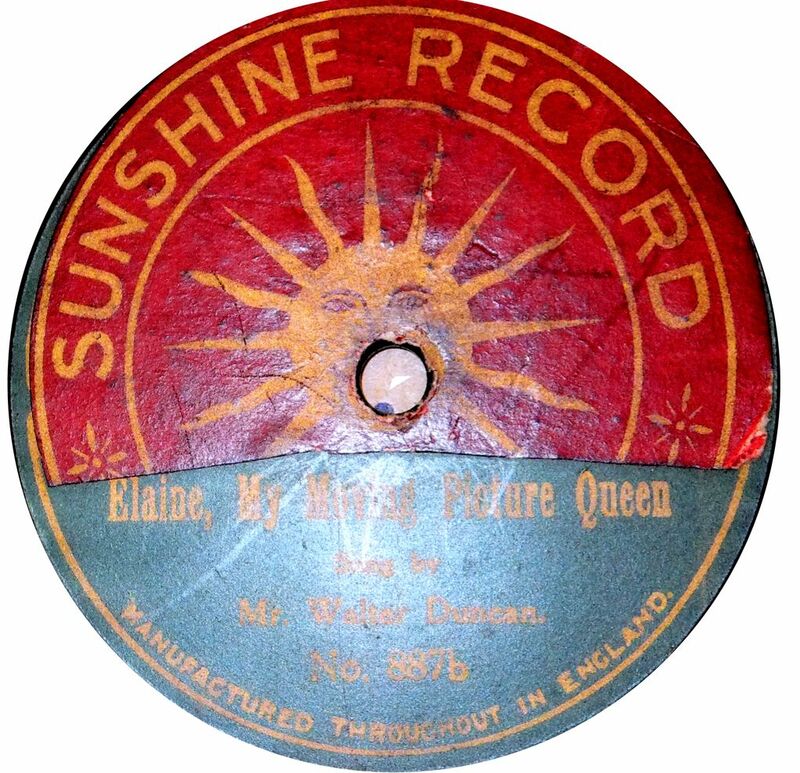 From the late 1920s I have a note of a company called Sunbeam Gramophone & Record Company Ltd. This company was formed in 1928 to take over Gramostyle Ltd of Camden St, Birmingham. Despite the name, it wouid appear to be mainly a manufacturer of gramophones, but records with this name were mentioned some years ago, though I have never seen one. 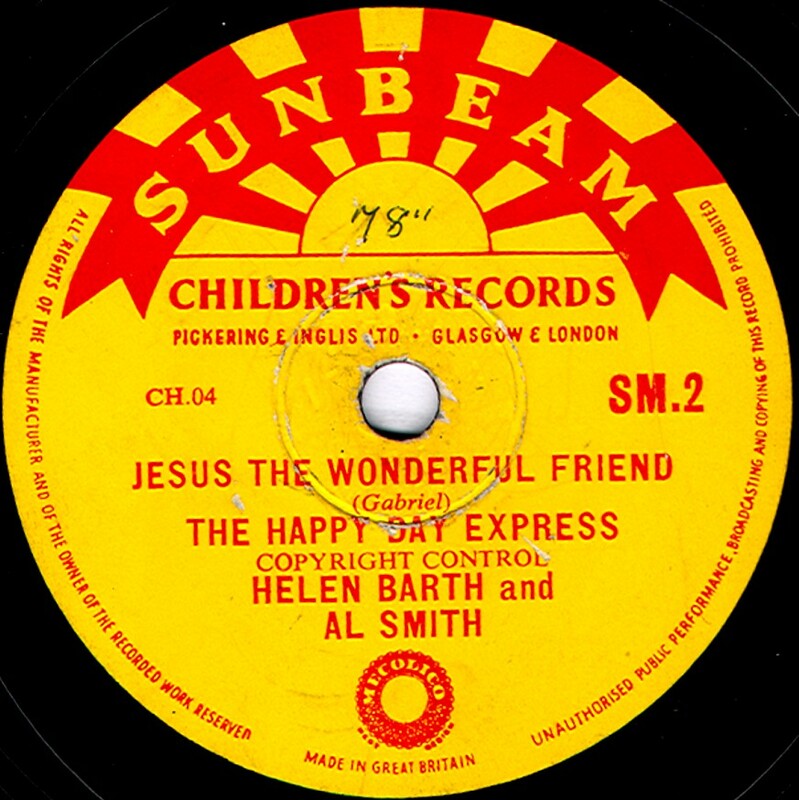 Then, from the post WWII era, another Sunbeam label was was made by Decca for Pickering & Inglis Ltd. From this sole example (see image), I would guess they are religious songs for children. 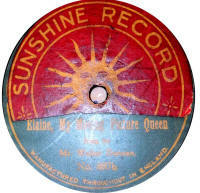 Sunshine This example is a partial paste-over label on a Coliseum record, maybe as an attempt to sell off obsolete stock. 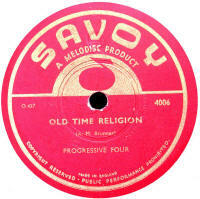 These were religious records made by Oriole (Levy's) for The Fred Squire International Party. 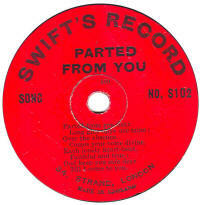 Swift's This was a 7" double sided record recorded & manufactured by Crystalate and dating from late 1925. 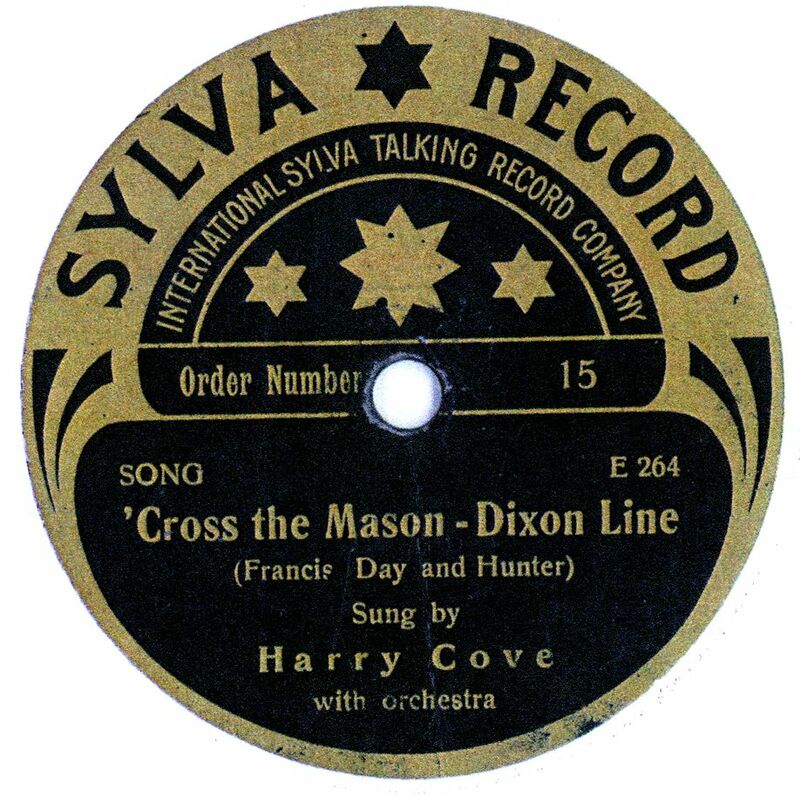 There is very little known about this record, nor about The International Sylva Talking Record Company, for whom the record was preoduced. 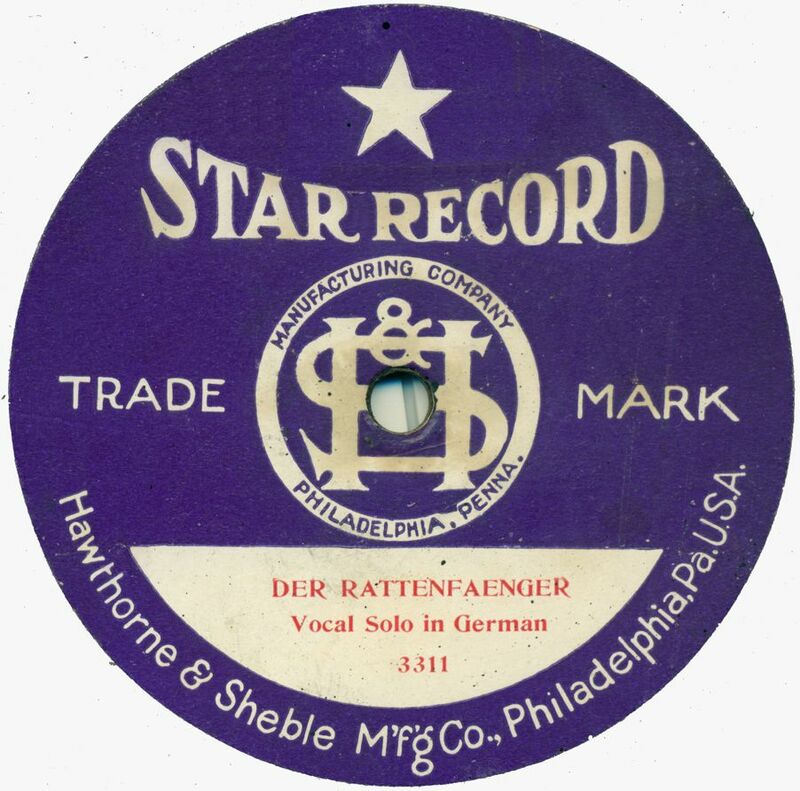 These records were made in Germany and date from about early 1914. 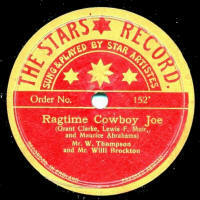 They slightly resemble "The Stars" record (see above) and may have used the same company to provide the masters. Thanks to Alan Williams for providing the label photo. 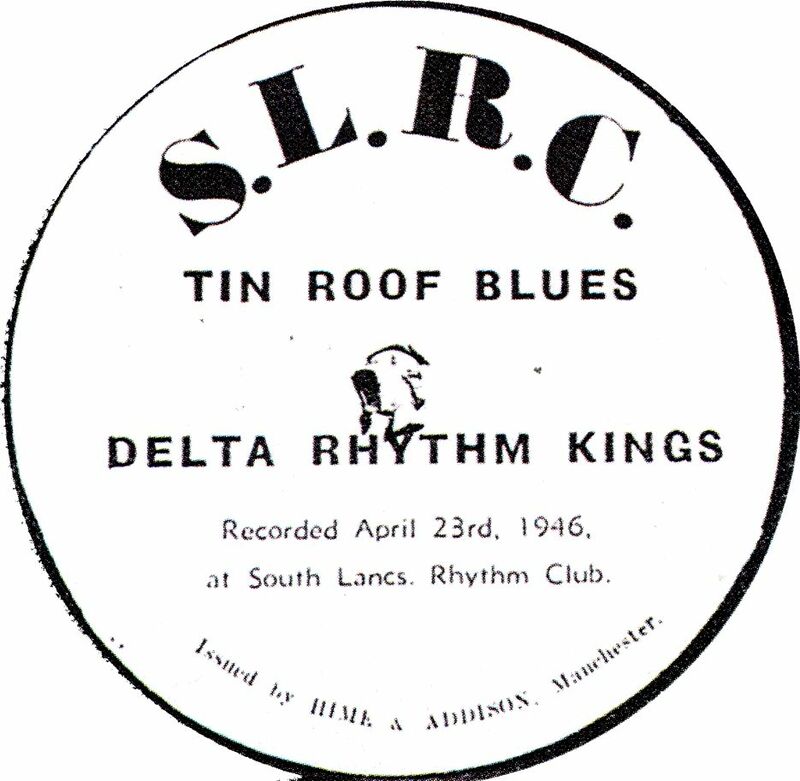 This was the house label for Chester Sound Recording Studios, which was based at Denson's of Chester. 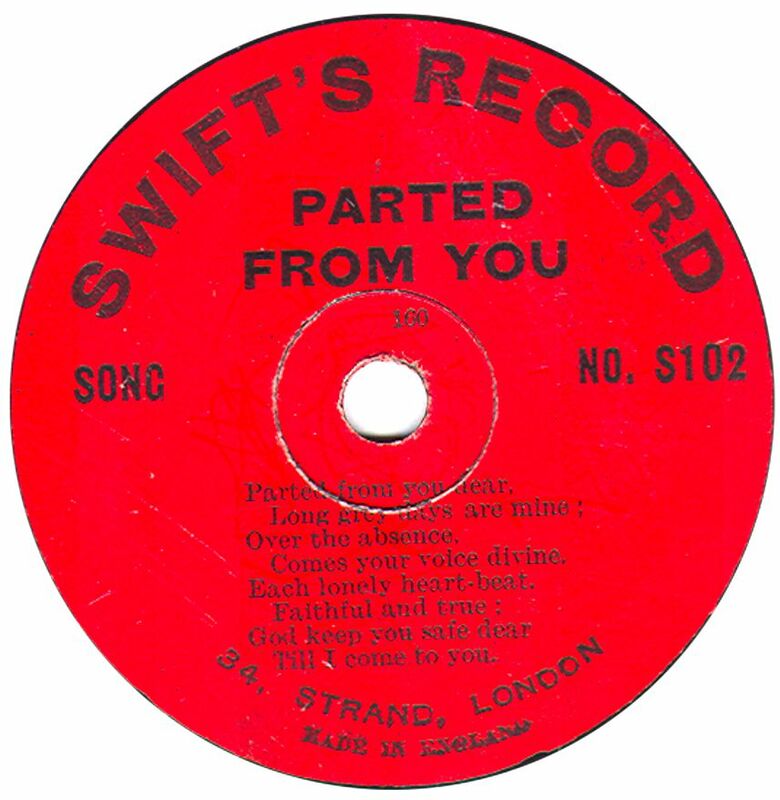 I notice the record appears to be a proper pressing (not a lacquer disc), with printed details on the label, but no catalogue number, implying they produced records specially to order rather than for sale to the public. Synchro This was one of the many Library (descriptive light music) labels that appeared in the late 1950s and into the 1960s. 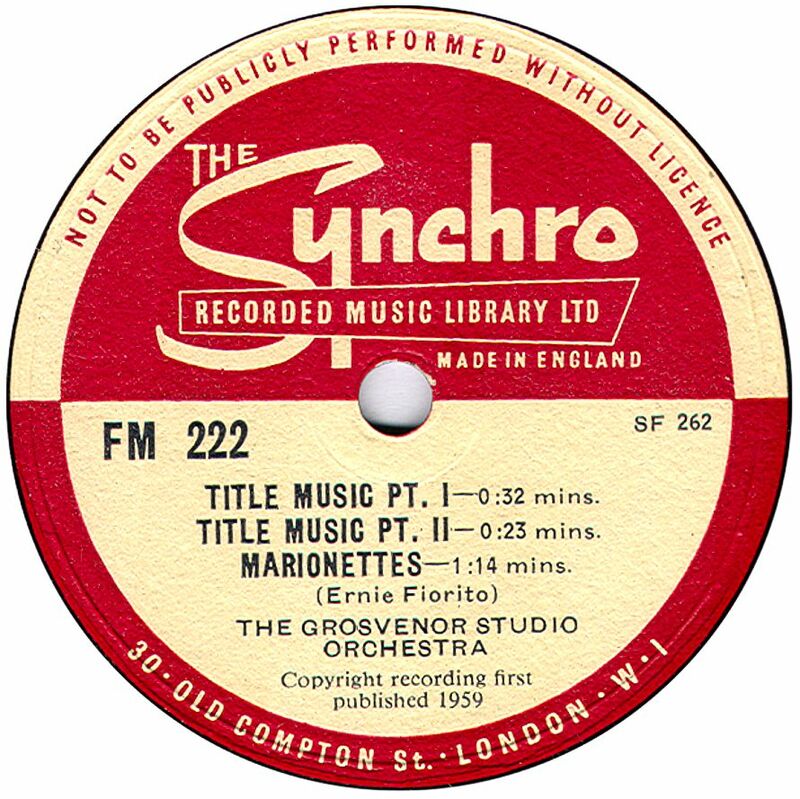 Presumably Synchro were a music publishe, but not one I'm familiar with and Synchro records are not one that I've come across very often. Syntok Film Record A report in "Gramophone & Radio News" in July 1929 reports that Harry Lauder and Leslie Sarony had been recorded by this company, who were based at 16, Garrick Street, London WC2. 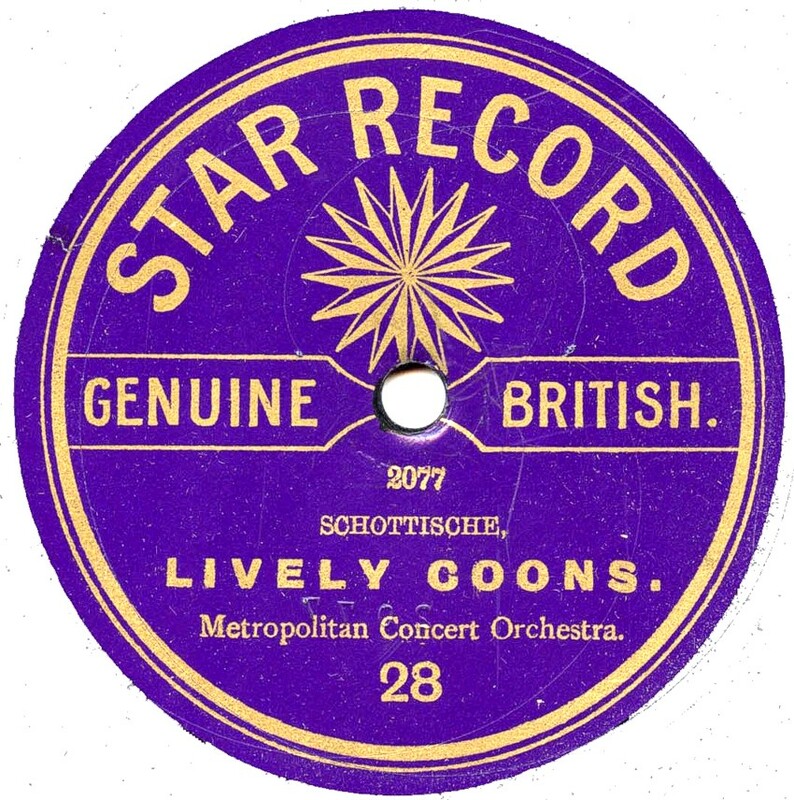 None of these records have been reported but it is assumed they would have been made to accompany a silent film, in the same manner as Vitaphone or British Phototone records. Syrena Grand This was a Russian-produced label made for Export to Britain in and around WWI. Sometimes spelled "SIRENA"